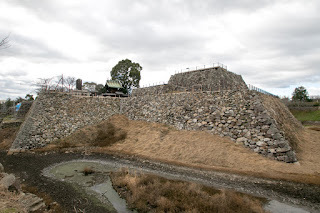 Koriyama castle (郡山城) is located at the center of Yamato Koriyama city, which is placed at the center of Nara basin. 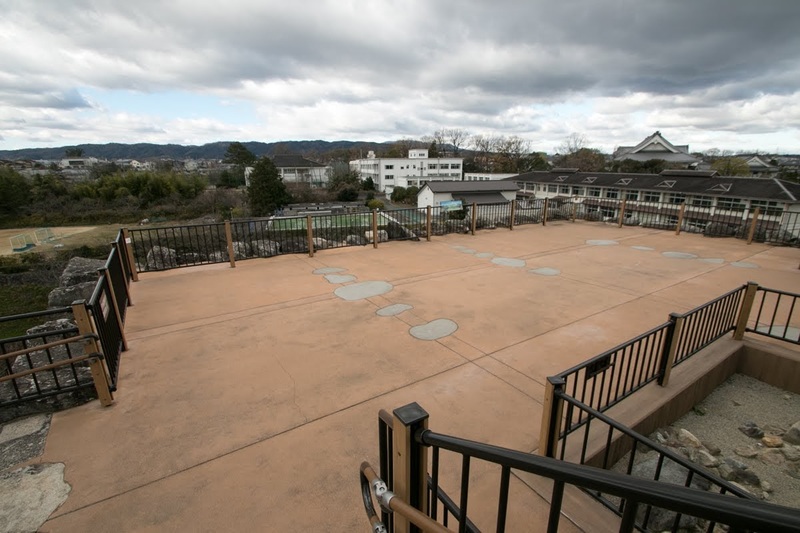 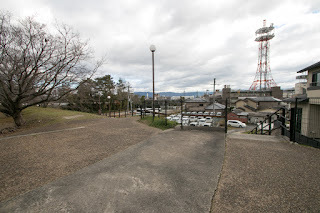 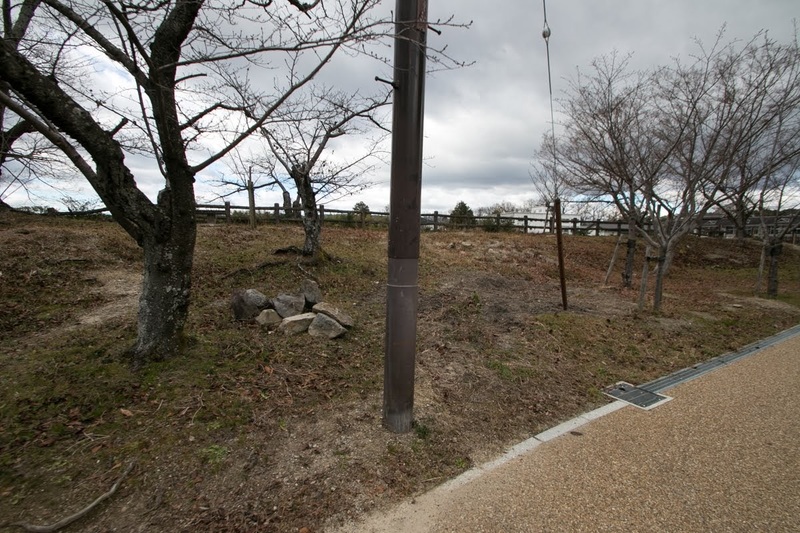 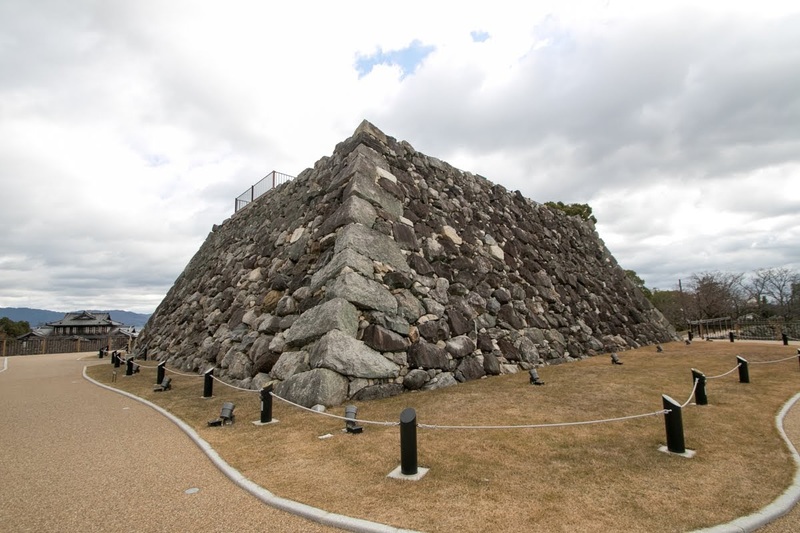 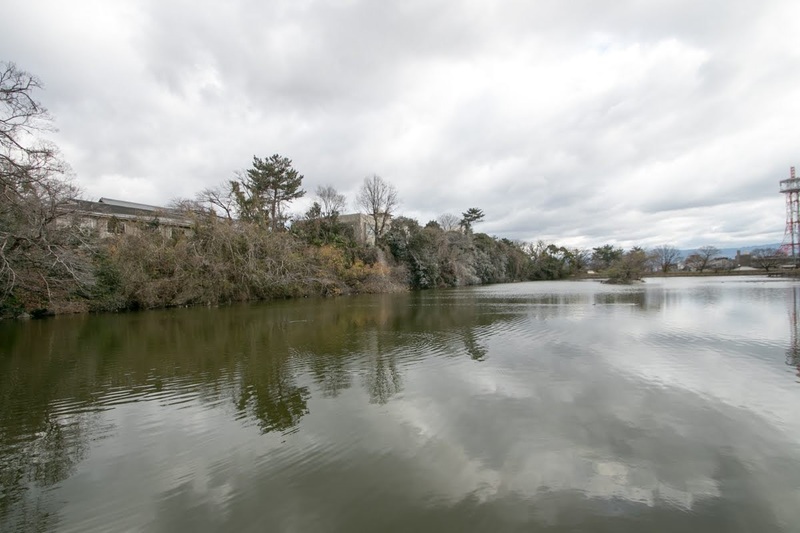 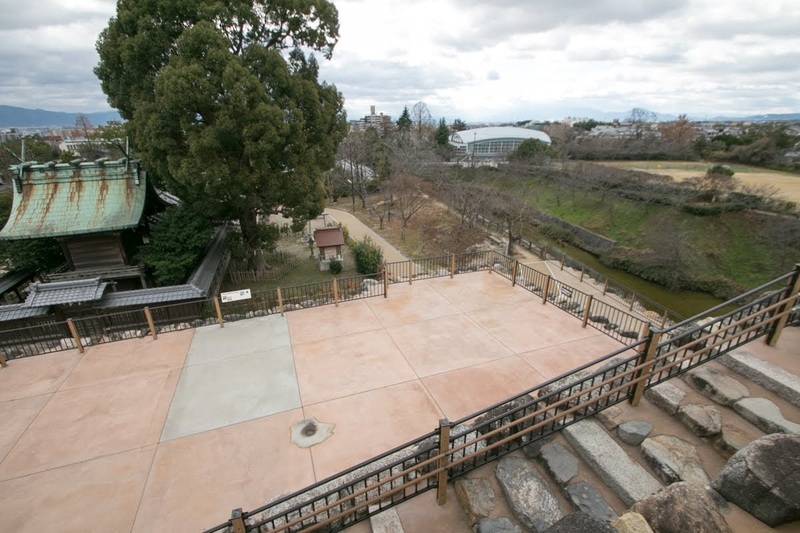 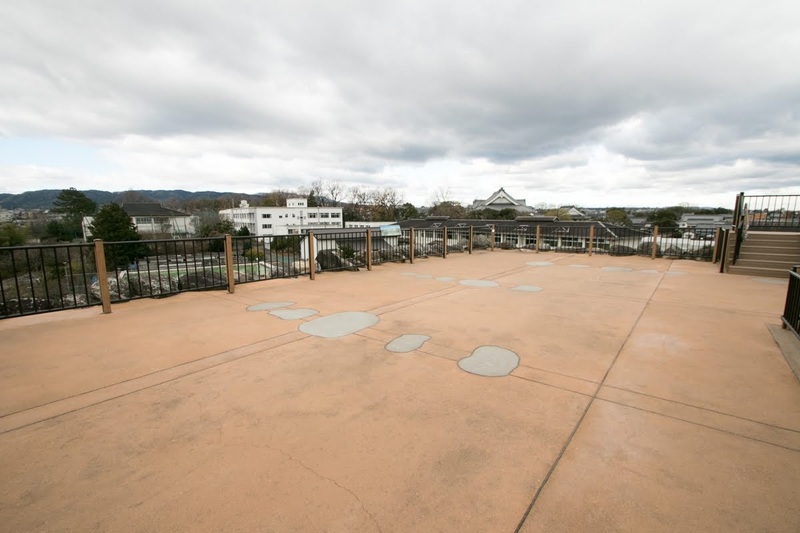 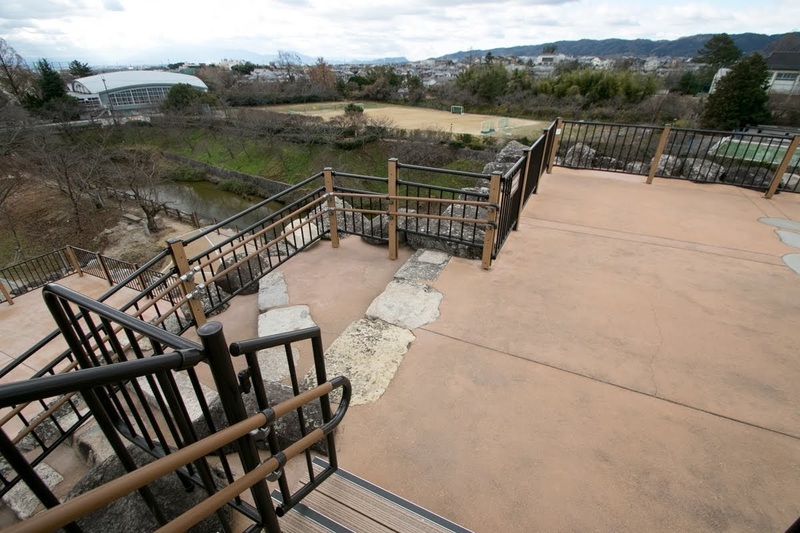 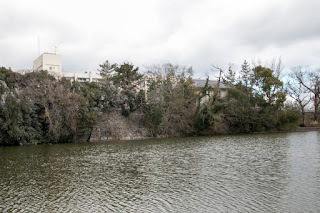 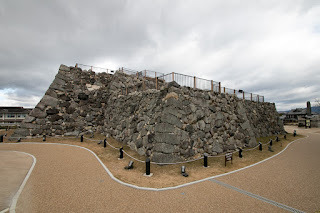 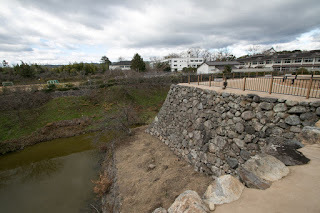 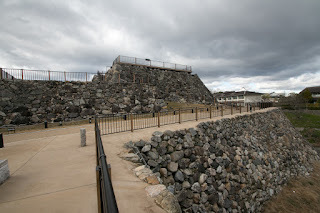 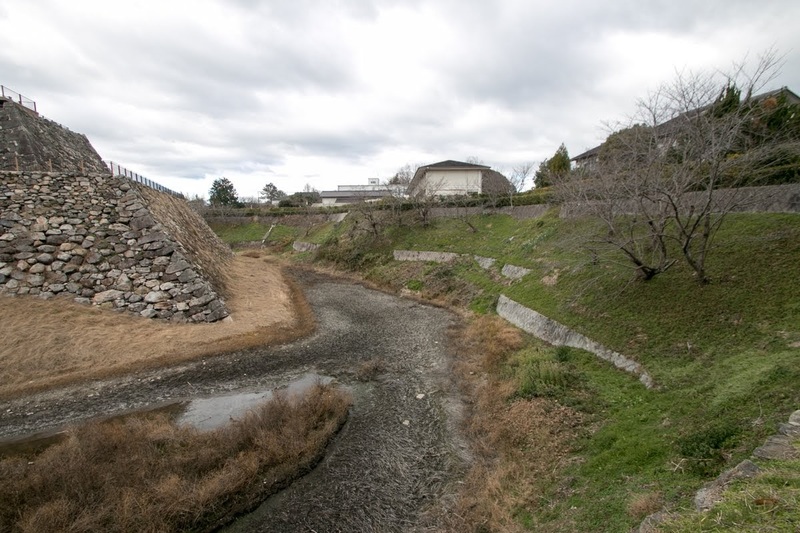 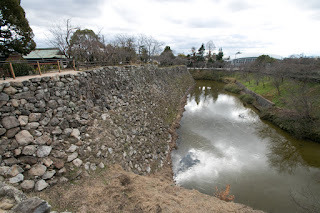 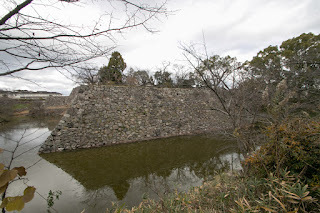 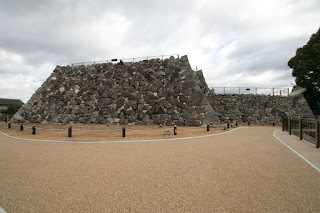 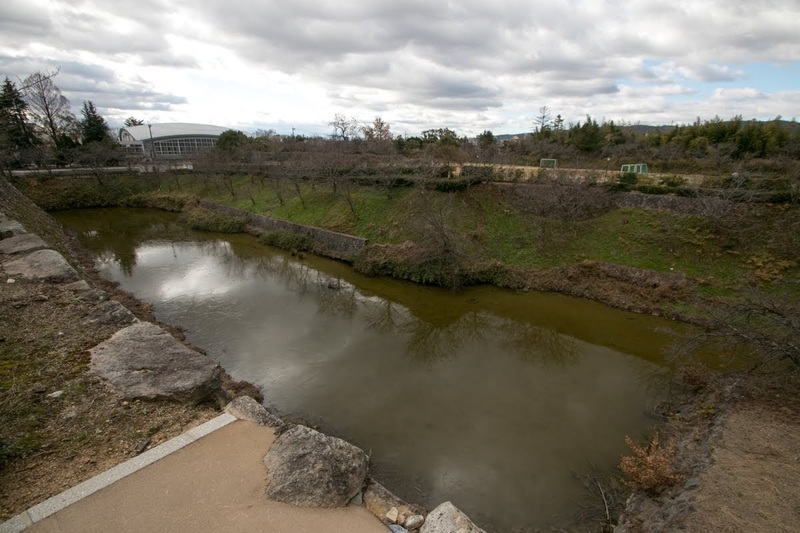 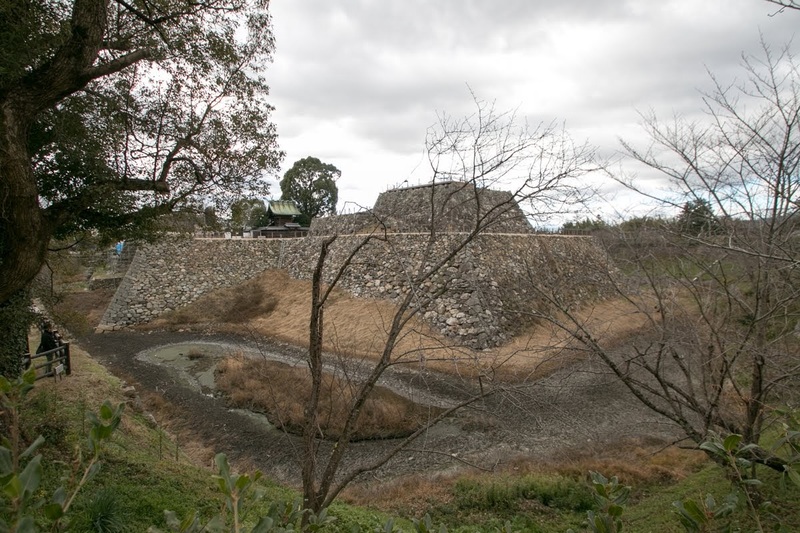 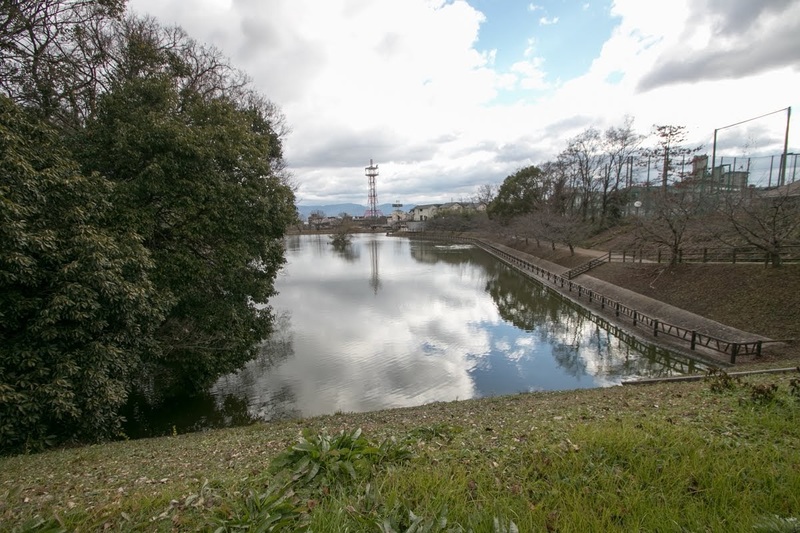 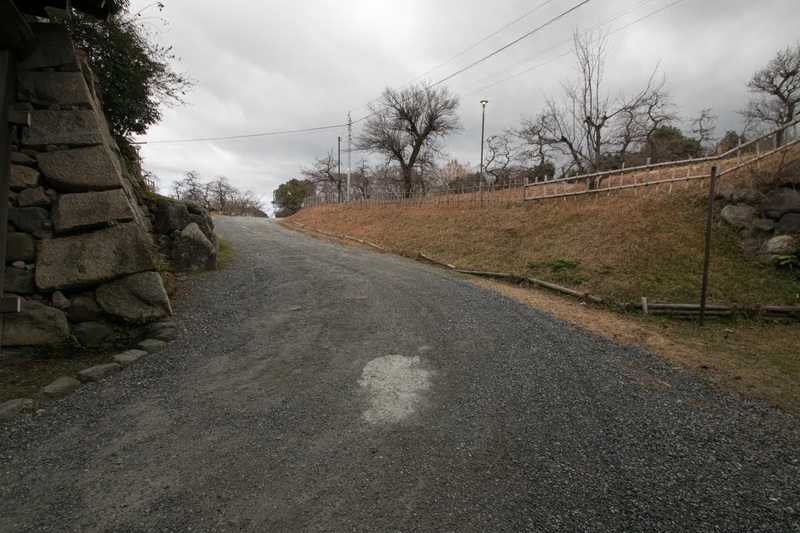 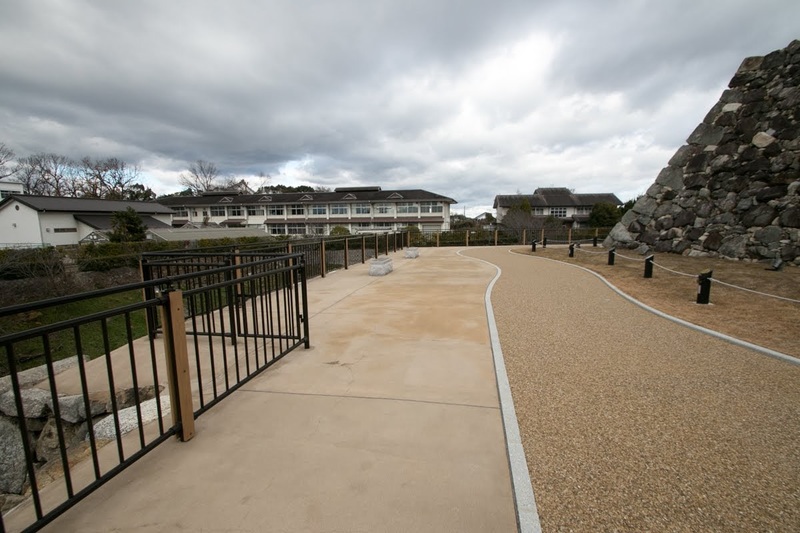 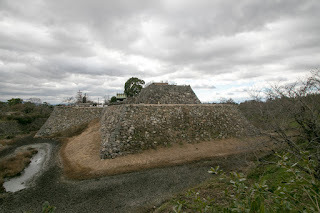 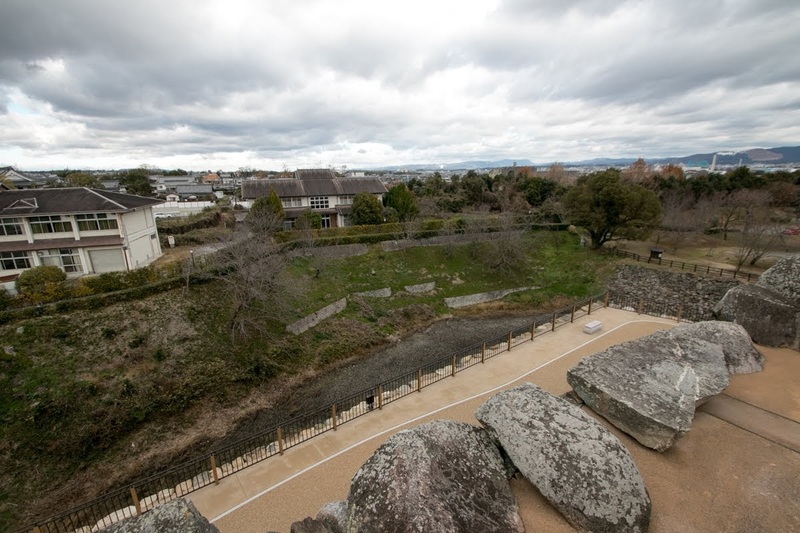 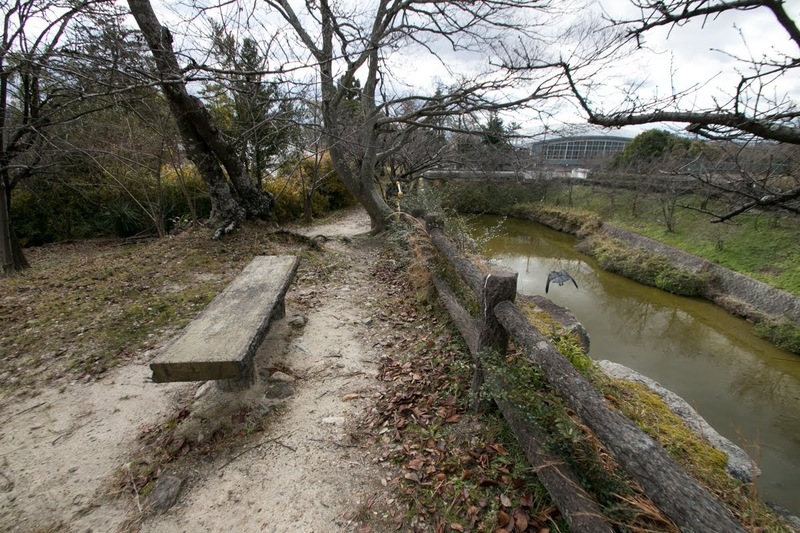 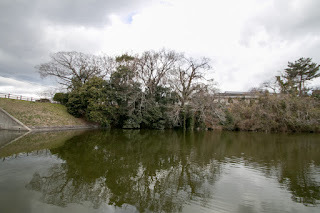 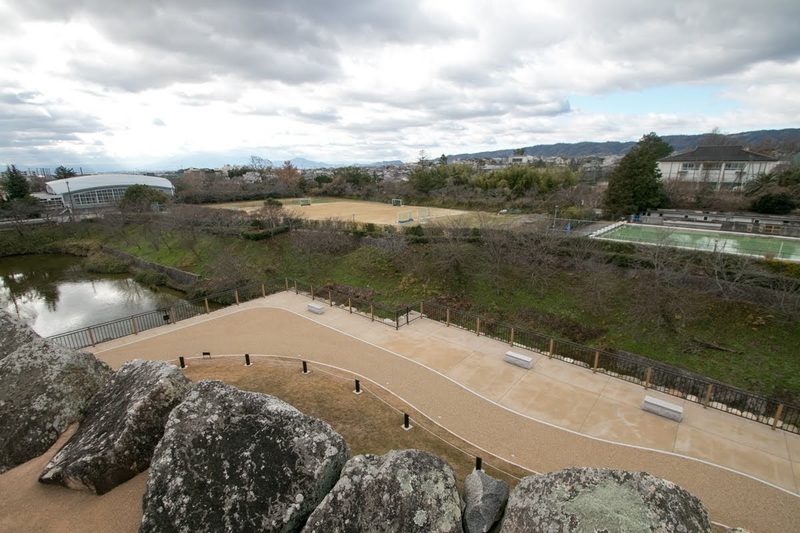 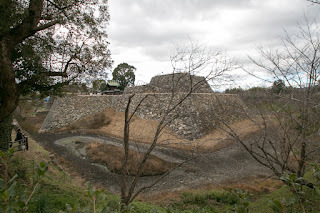 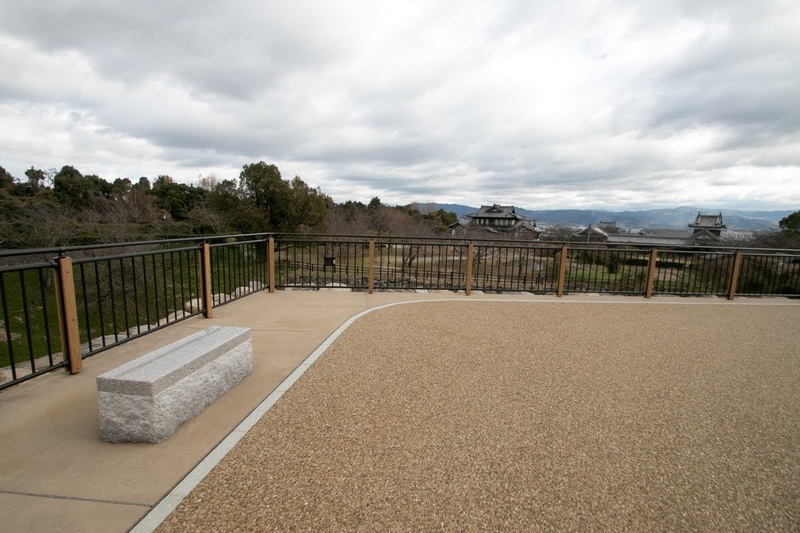 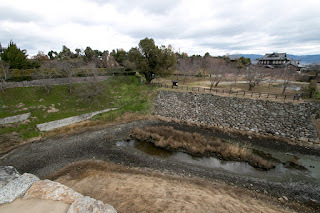 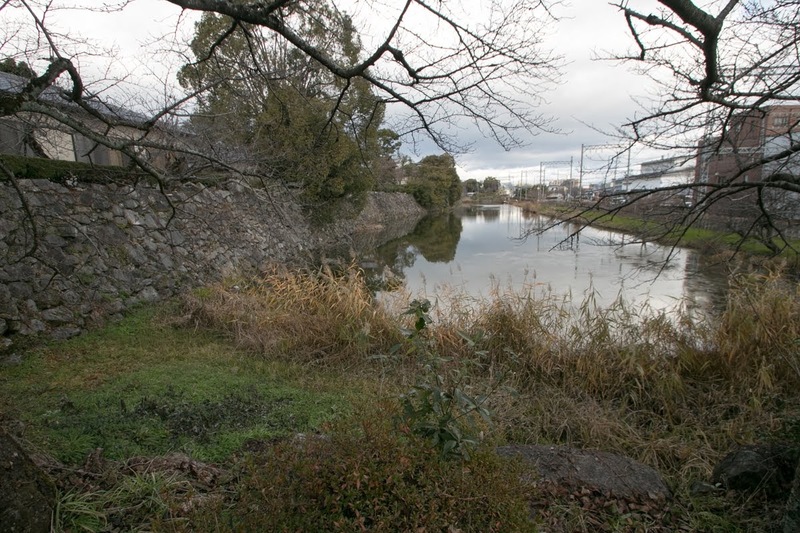 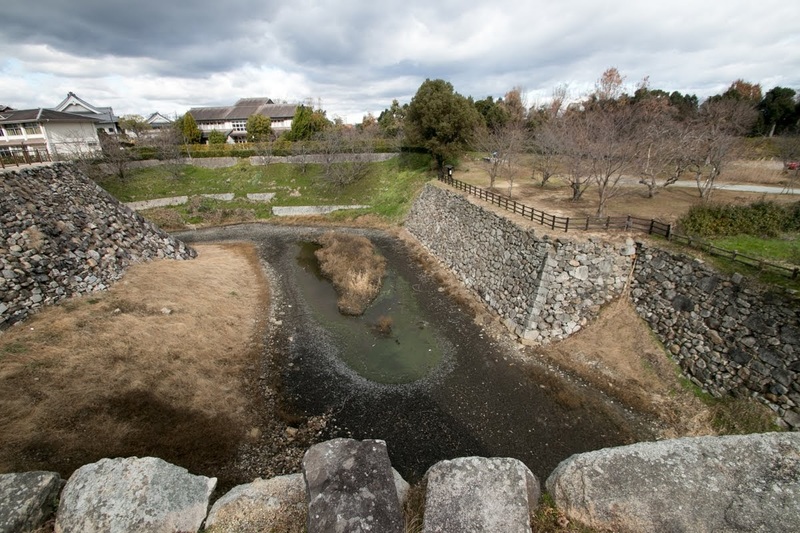 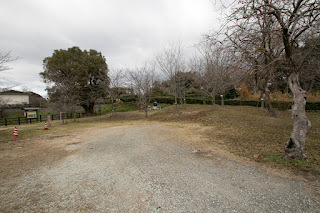 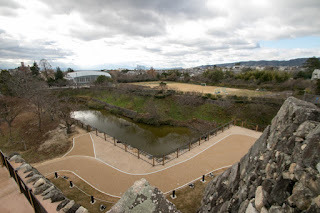 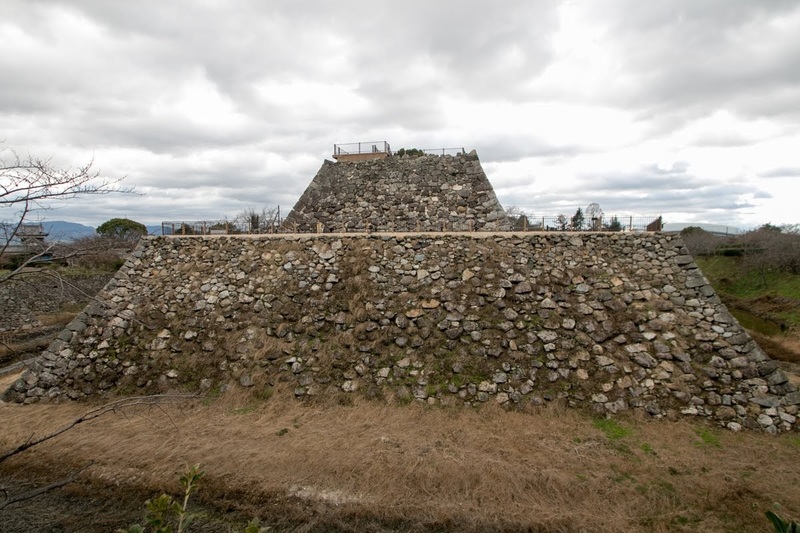 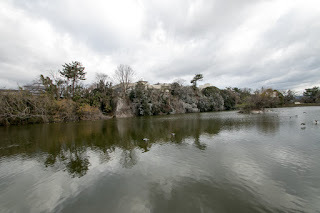 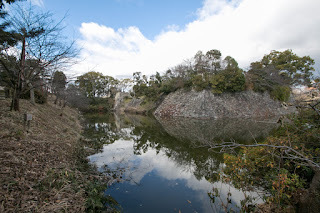 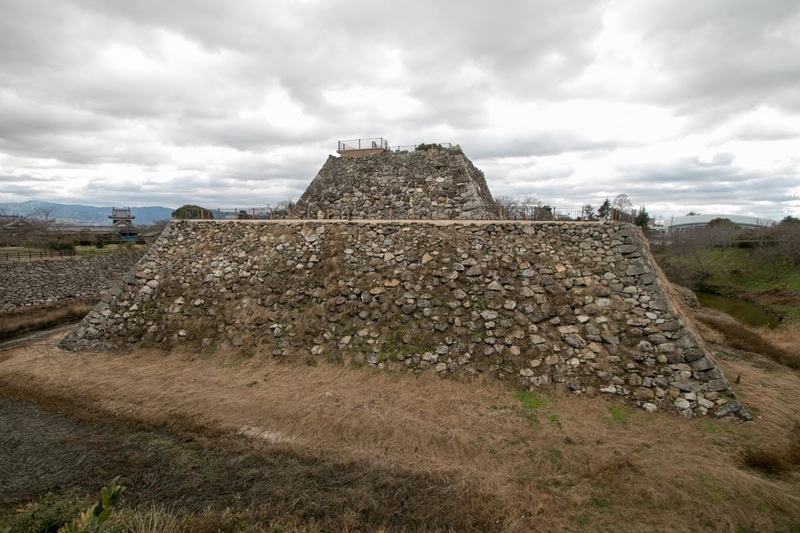 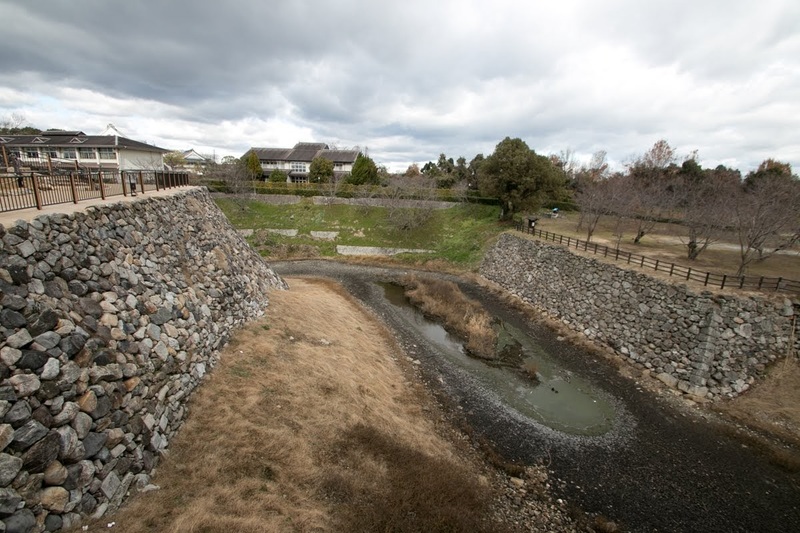 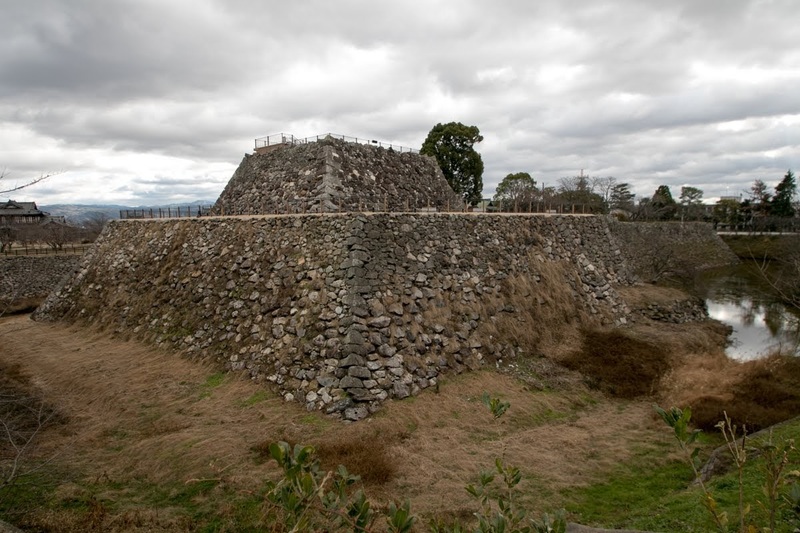 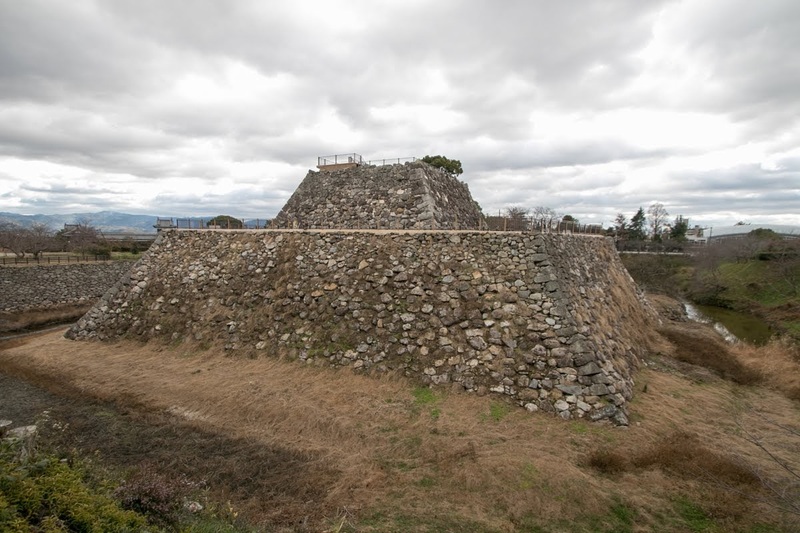 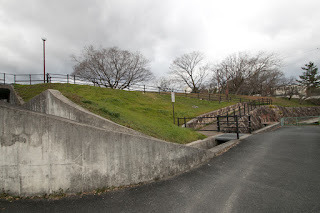 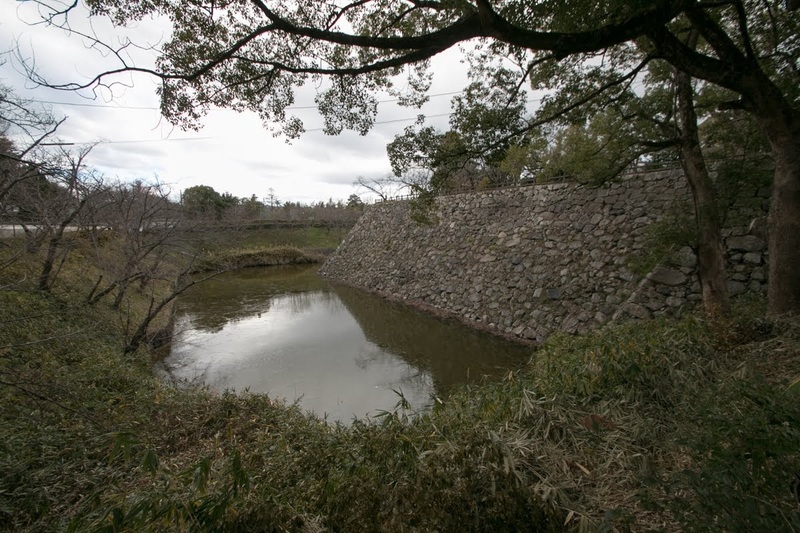 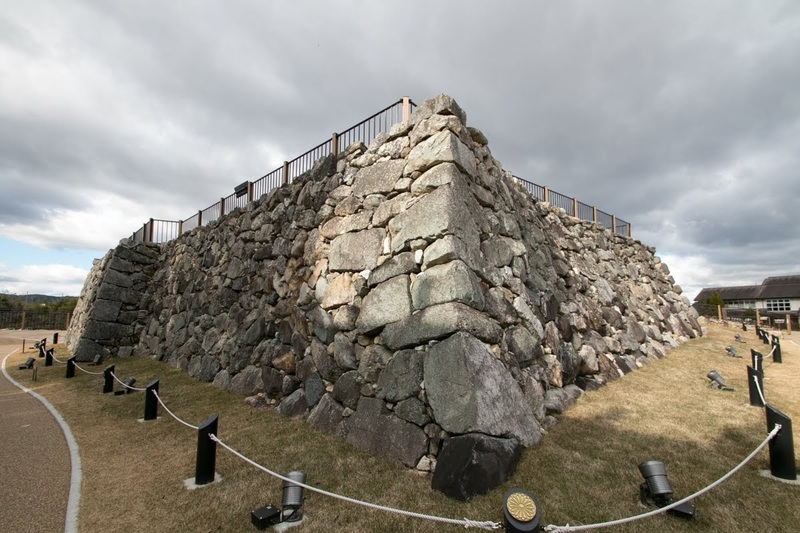 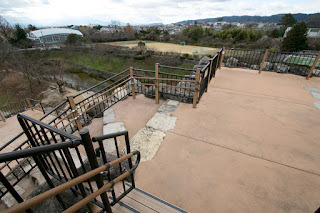 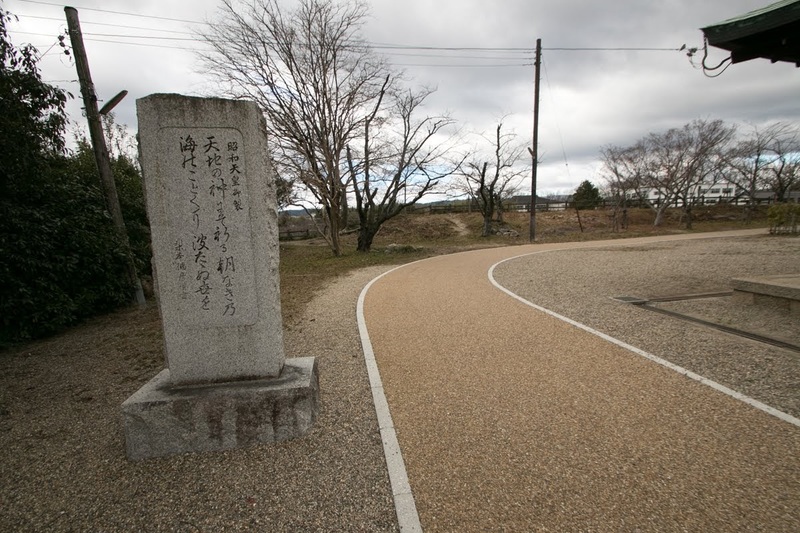 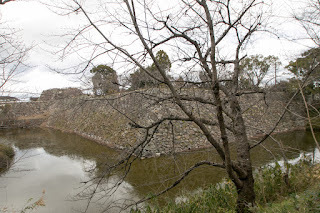 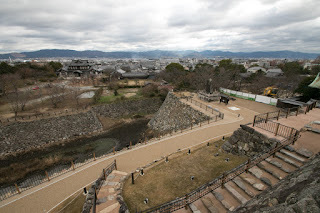 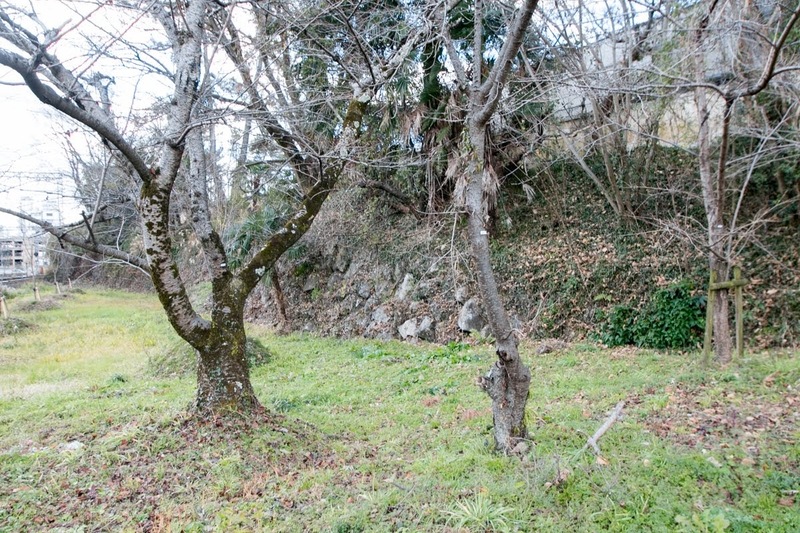 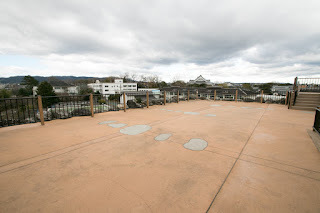 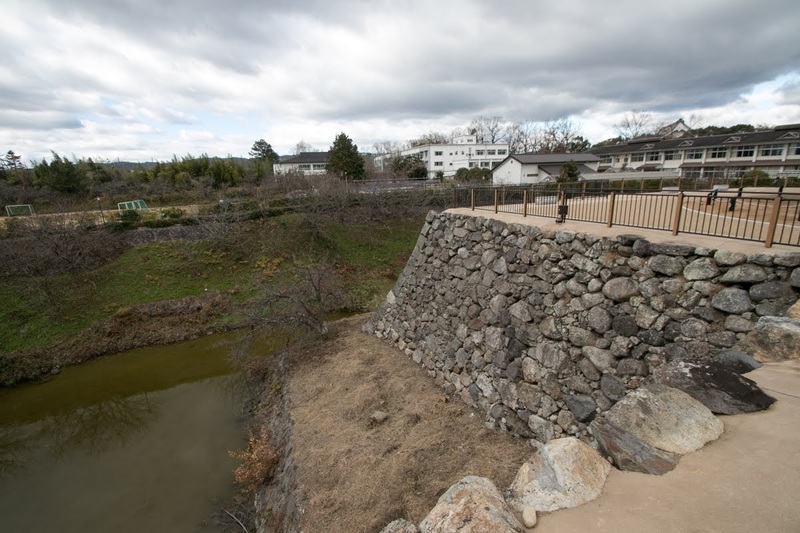 The site of Koriyama castle is a peninsula shaped height protrudes from northward and surrounded by two rivers, and the castle was built utilizing south edge of this height. 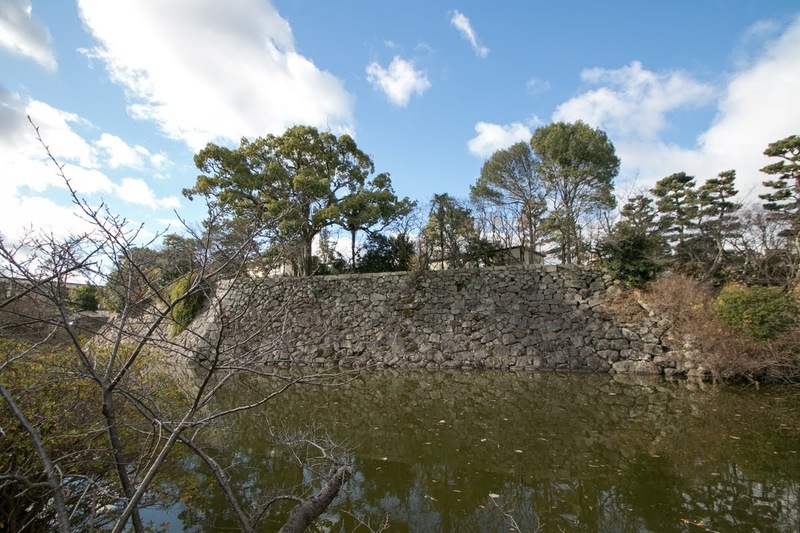 Koriyama castle was originally built by Jynkei Tsutsui (1549-1584). 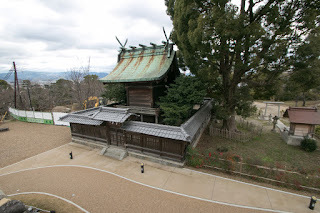 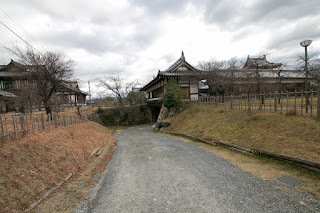 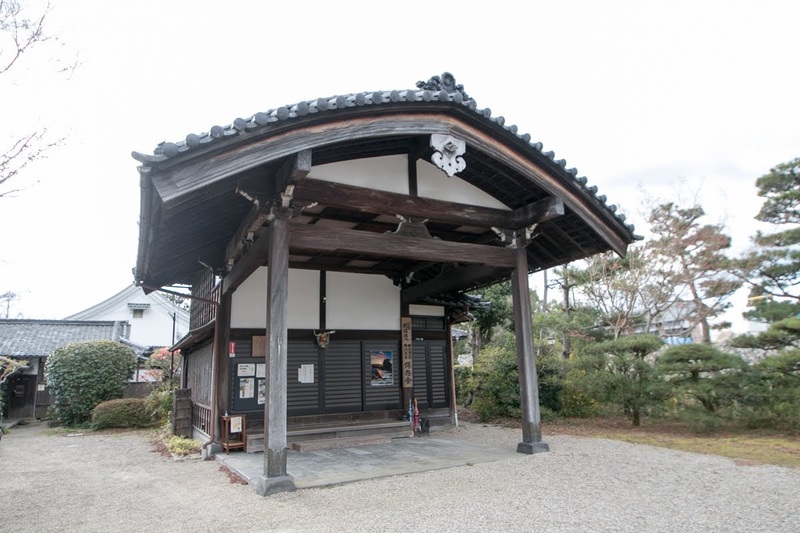 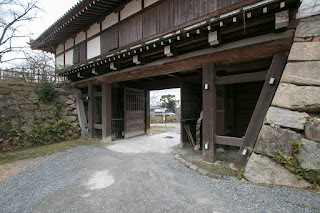 Tsutsui clan was originally a house of administrative officer of Kofukuji temple, a large temple located at Nara city and which has a long history from 10 century. 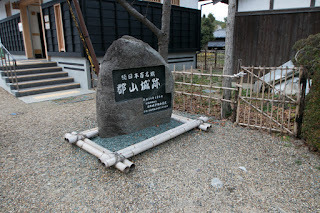 Prior to 14th century local lords of Yamato country (Nara prefecture) were organized by religious powers such as Kofukuji temple or Kasuga shrine, but on and after 15th cemtury, large local lords such as Tsutsui clan, Ochi clan or Akiyama clan gradually increase their powers and established their own dominance. 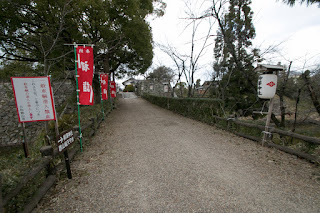 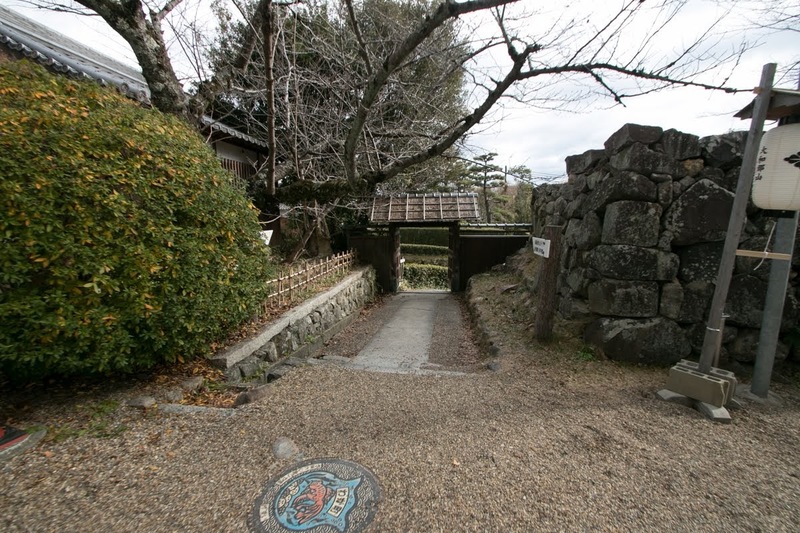 Tsutsui clan originally held the middle part of Nara basin and located at Tsutsui castle. 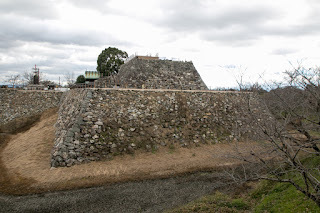 They gradually expand their power and beated Ochi clan, a large local lord at Takatori castle, but from the middle of 16th century they suffered intrusion of Hisahide Matsunaga (1510-1577) at Shigisan castle. Tsutsui castle was once deprived by Hisahide, and later Junkei recovered the castle but faced pressure from Hisahide who was supported by central ruler Nobunaga Oda (1534-1582). 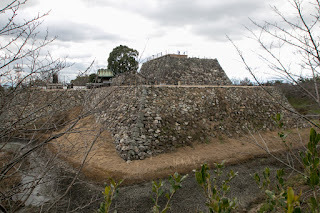 But Hisahide attempted to revolt to Nobunaga and failed, and lost his power. 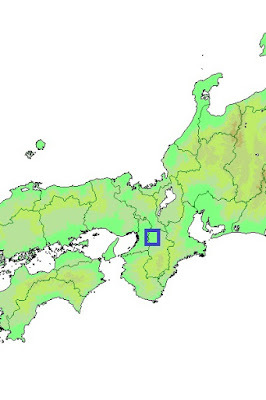 Contrary to this, Jyunkei substituted to Nobunaga and was nominated as the governor of Yamato country in 1576. Finally Hisahide was attacked by Oda army and died at Shigisan castle in 1578, and Jyunkei at last united Yamato country. 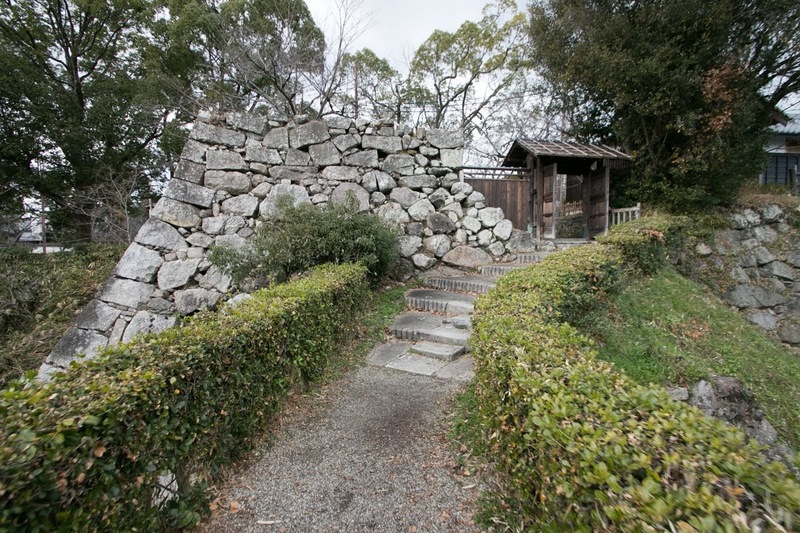 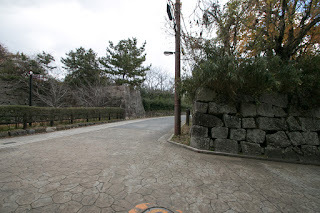 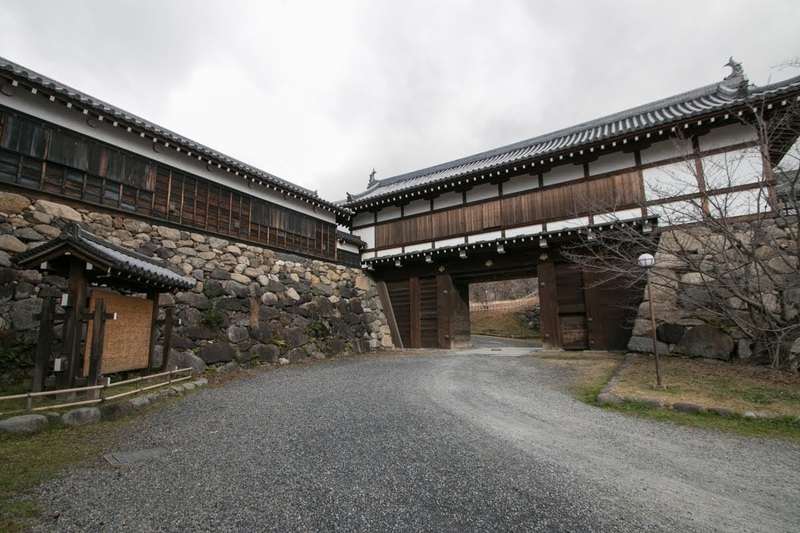 As Tsutsui castle was a small castle located at flat land, Jyunkei planned to build a new residence. 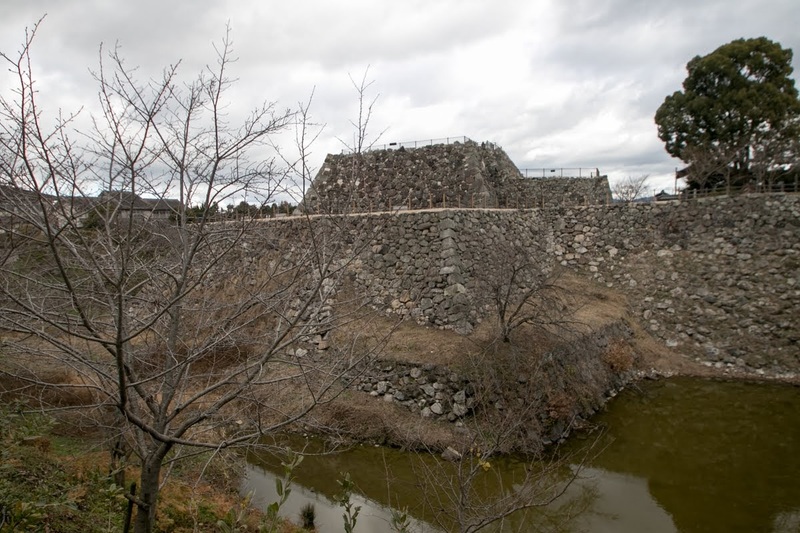 Just that time Nobunaga ordered Jyunkei to integrate castles and break unnecessary ones, thus Jyunkei built Koriyama castle and moved there. 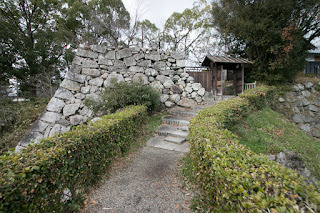 At the time of Jyunkei there already existed small main tower. 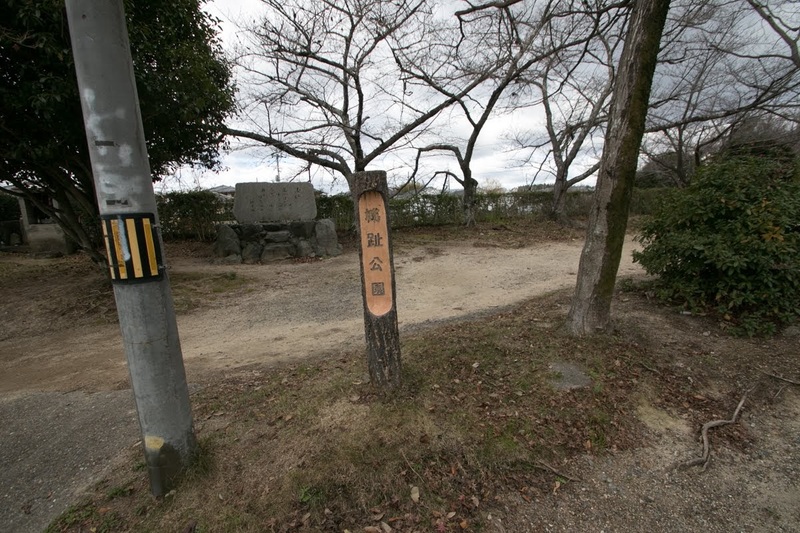 At Oda army Jyunkei was placed as a general under Mitsuhide Akechi (1528-1582), a vassal of Nobunaga and regional commander of Kinki region. In 1582, Mitsuhide carried out Honnoji no Hen (incident of Honnoji ), a coup d’etat to Nobunaga and killed him. 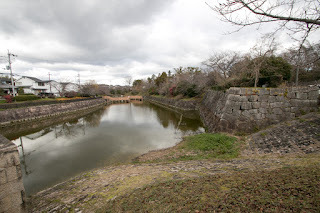 As a subordinate general Jyunkei was asked to support Mitsuhide, and Jyunkei at first consented. 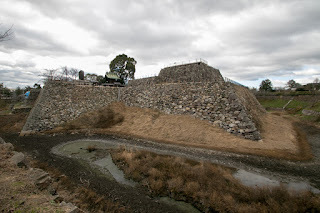 But knowing that Hideyoshi Hashiba (1537-1598, later Hideyoshi Toyotomi), the regional commander of Chugoku area, returning to Kinki region along with huge army for revenge, Jyunkei decided to keep neutral and besieged at Koriyama castle. 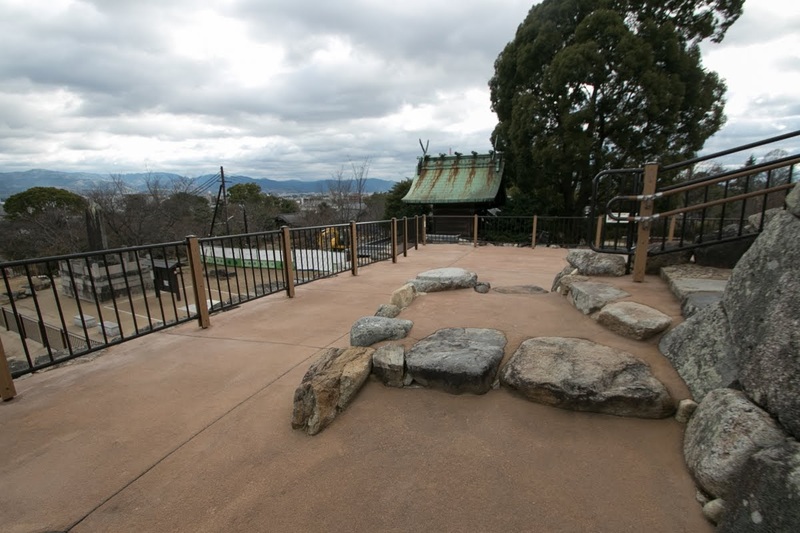 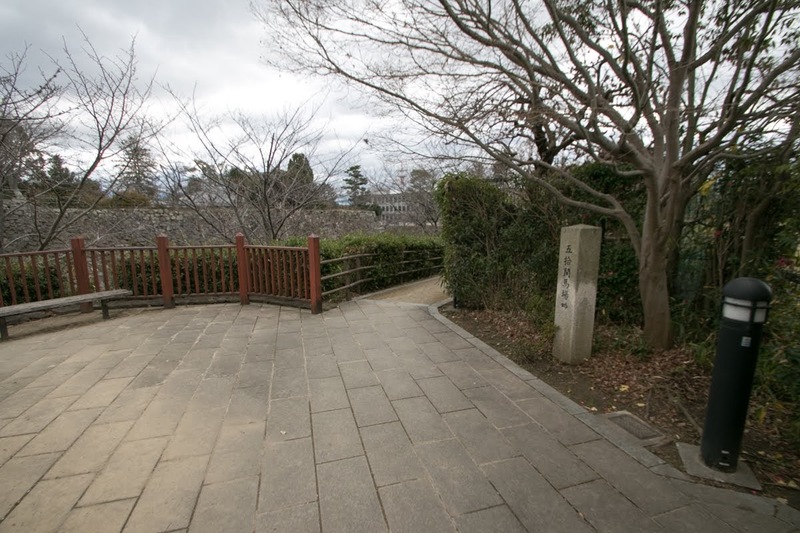 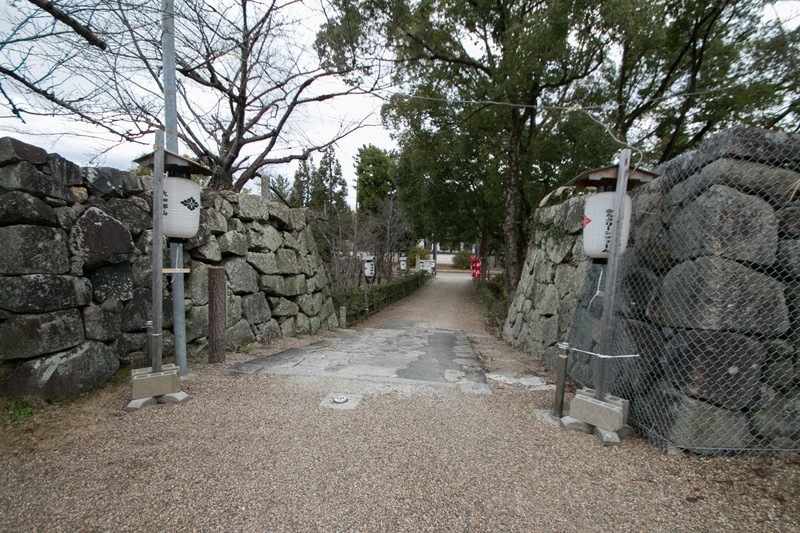 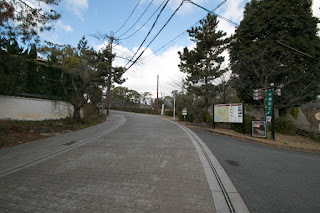 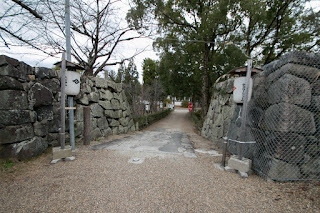 It is said that at that time Jyunkei watched the situation at Horagatoge path, the border of Yamashiro country (Kyoto prefecture) and Yamato country, thus today waiting and seeing how’s it going is expressed as “perform Horagatoge path”. Due to this action Tsutsui clan was aproved to continue by Hideyoshi, but two years later Junkei died in ill and his successor Sadatsugu Tsutsui (1562-1615) was transferred to Iga country (western part of Mie prefecture) in 1585. 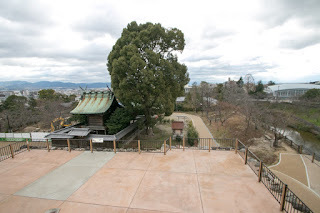 Hideyoshi appointed his younger brother Hidenaga Toyotomi (1540-1591) as the governor of Yamato country. Hidenaga was the younger brother of Hideyoshi Toyotomi, but is said that he was born from another father. 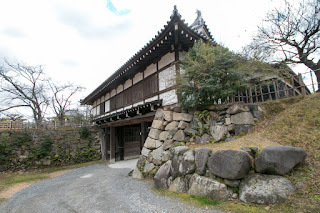 Originally he succeeded his native house in place of Hideyoshi who left the house to become the Samurai, but when Hideyoshi married and promoted to a commander, Hidenaga was asked by Hideyoshi and served to his brother. 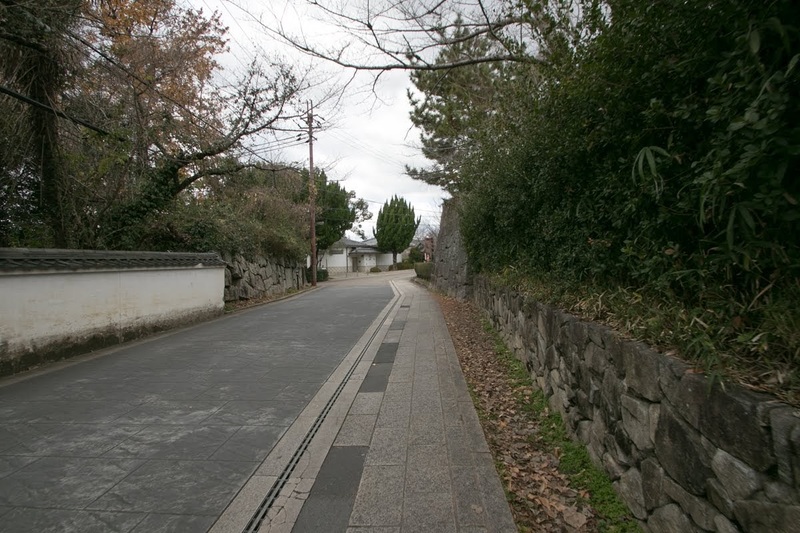 Hidenaga was gentle and paied attention well, then contributed to organize mixed up generals of strong personality under Hideyoshi. Gradually Hidenaga became to lead the force as a deputy of Hideyoshi or a detached force, and also kept the backward when Hideyoshi fought at front side. When Hideyoshi was appointed as a regional commander of Chugoku region and started to fierce battle against Mouri clan, Hidenaga advanced to Sanin area and guarded side of Hideyoshi who mainly fought at Sanyo area. Aroung this time Hidenaga hired his own generals, and Takatora Todo (1556-1630) was hired by Hidenaga. 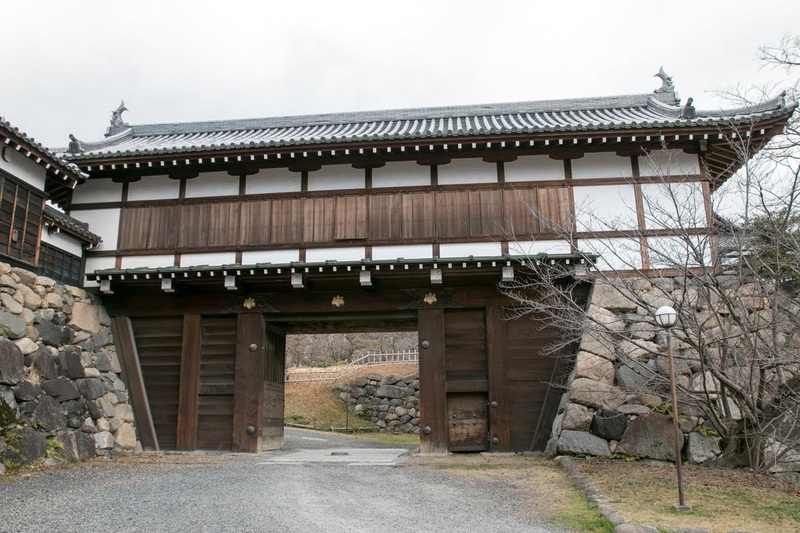 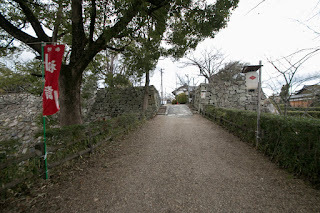 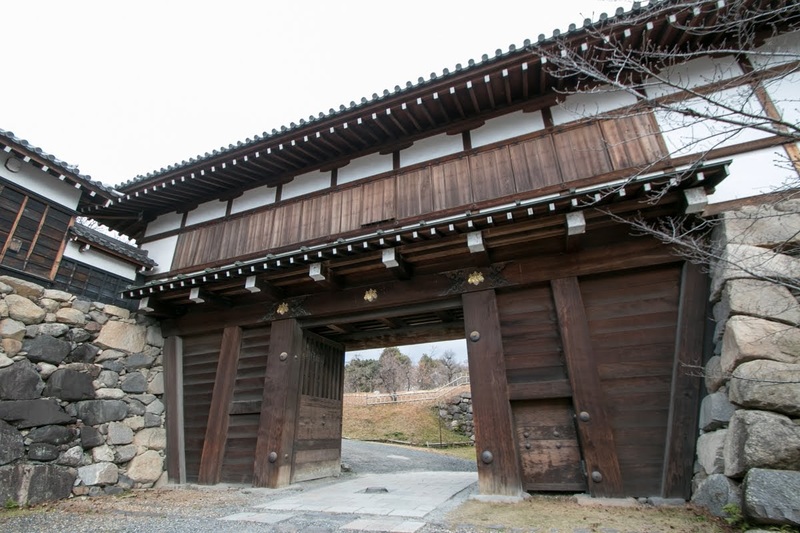 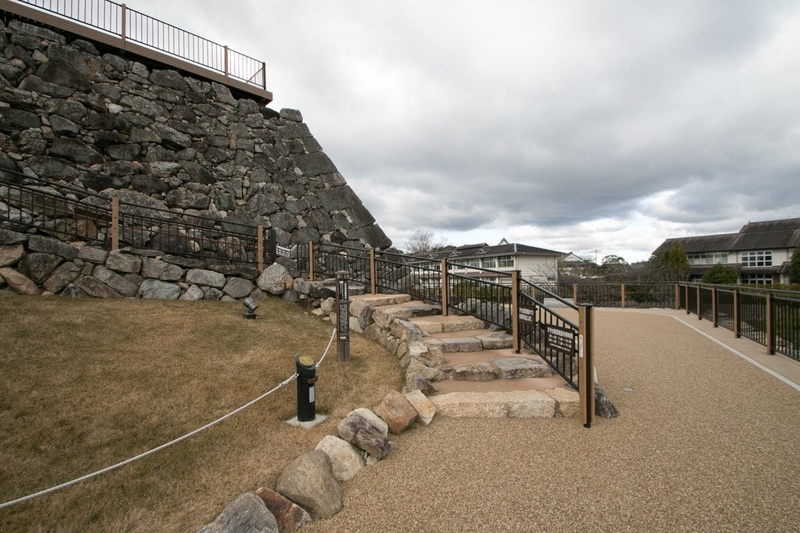 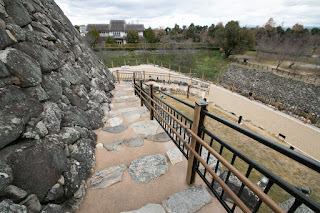 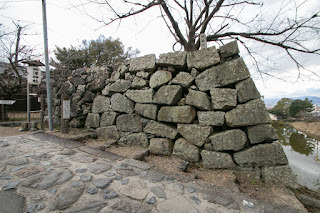 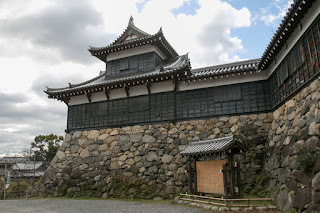 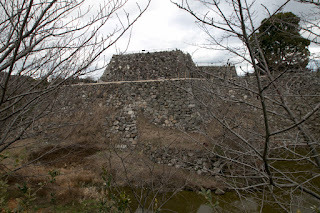 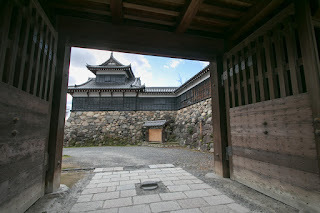 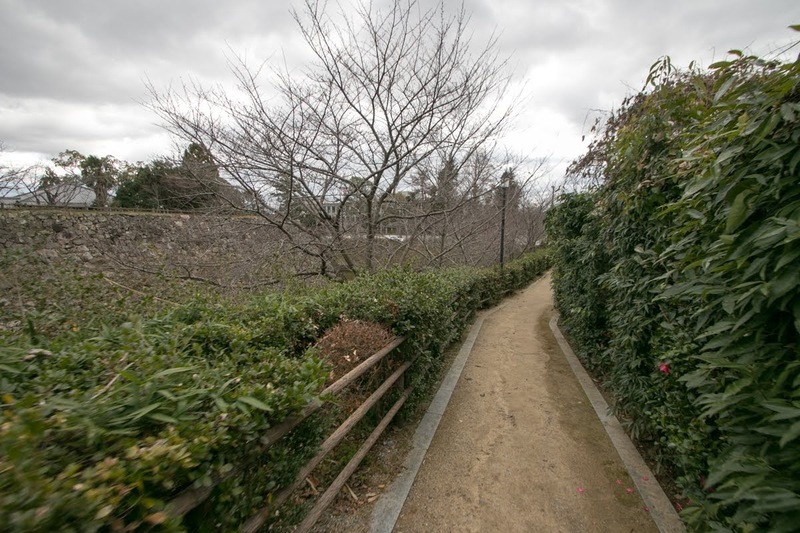 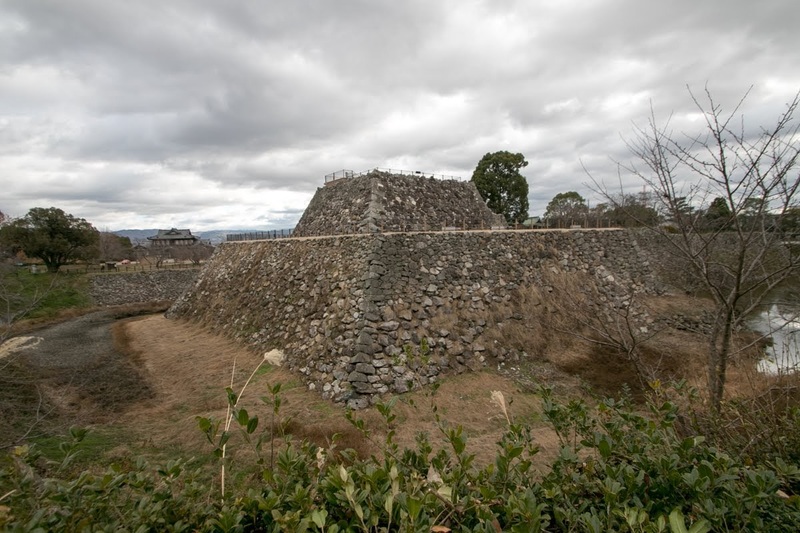 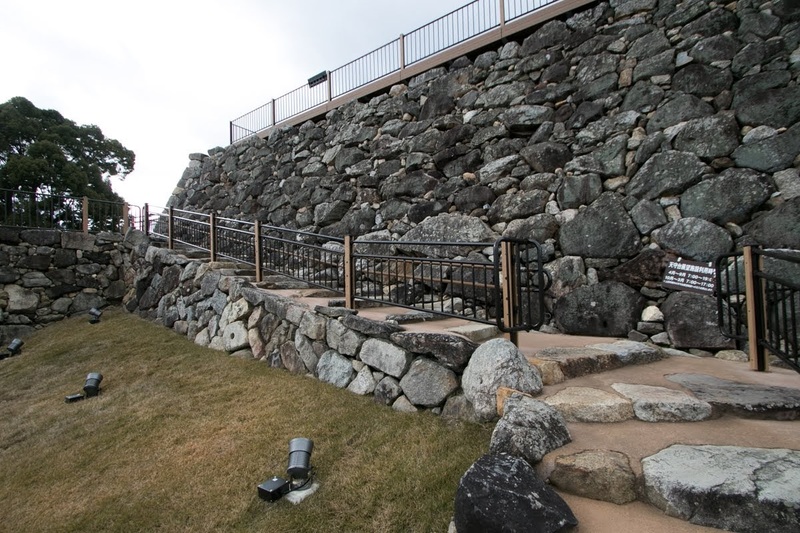 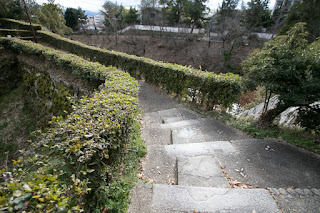 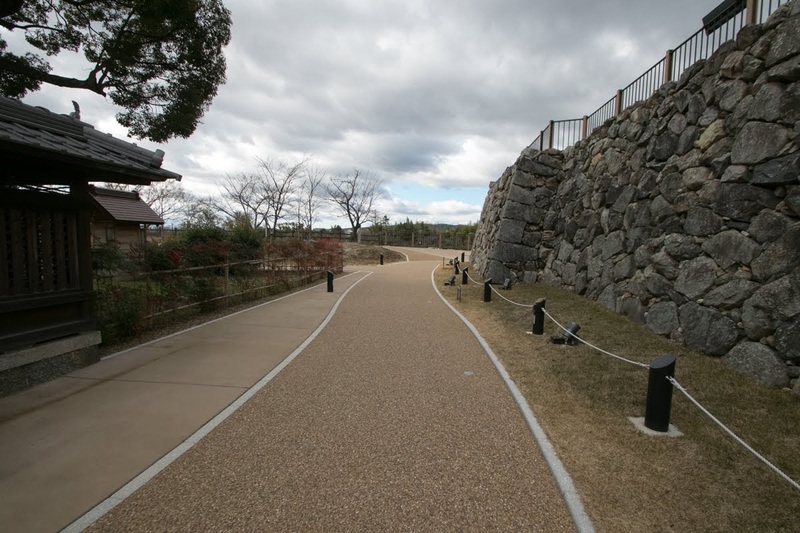 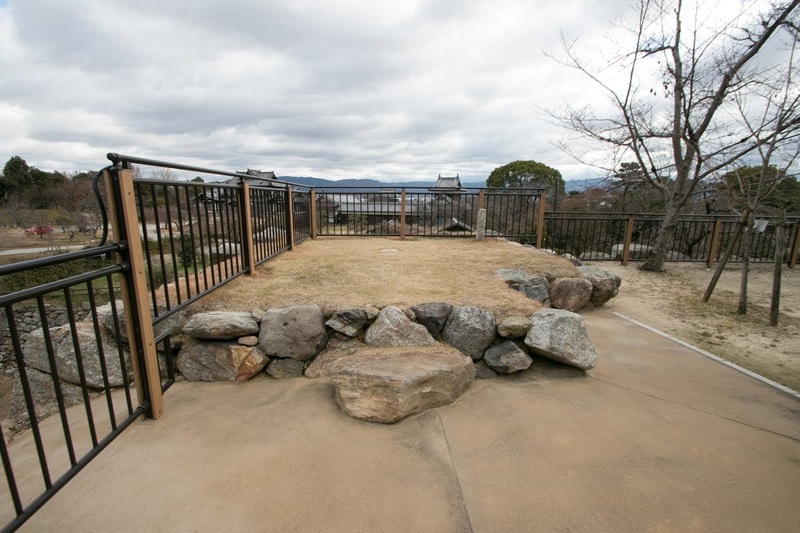 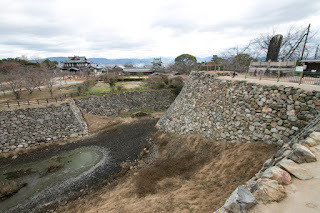 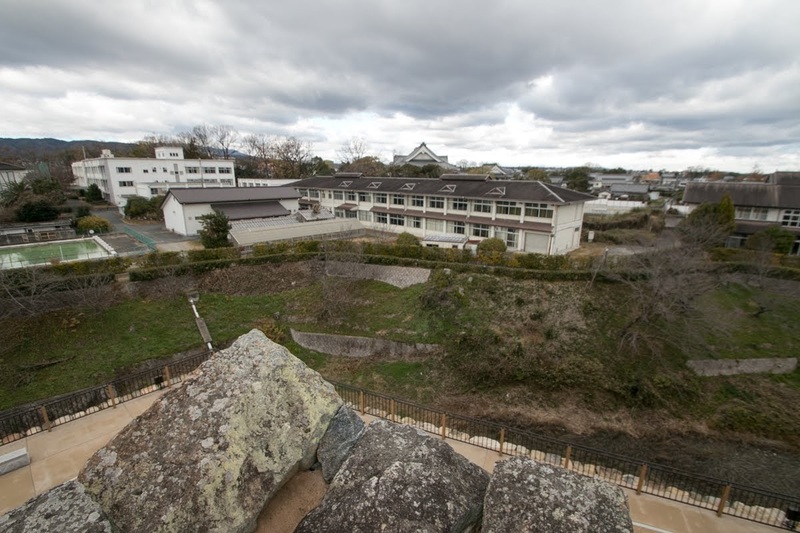 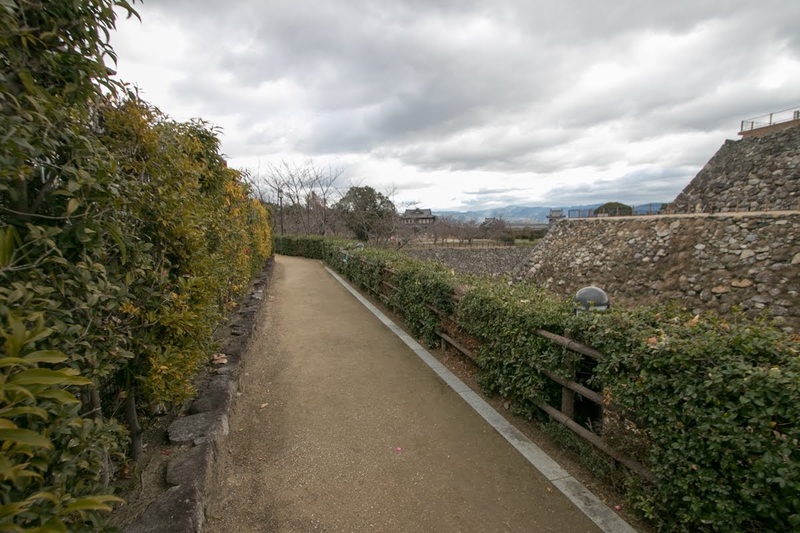 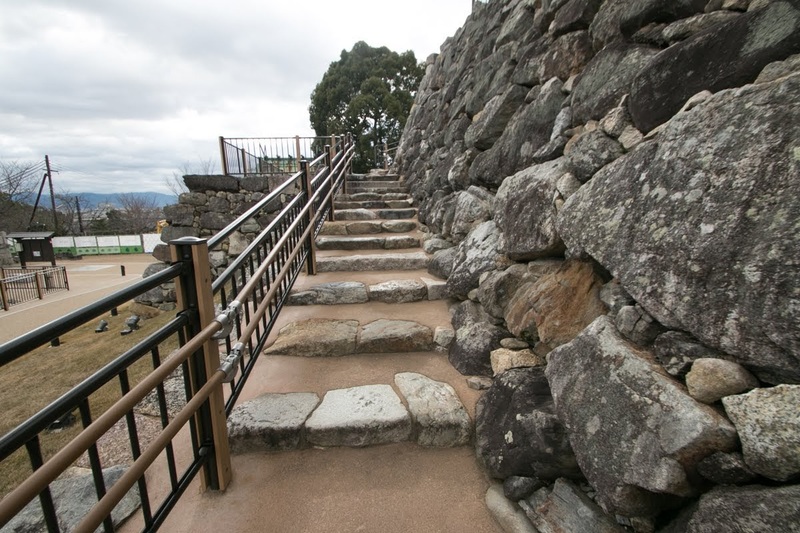 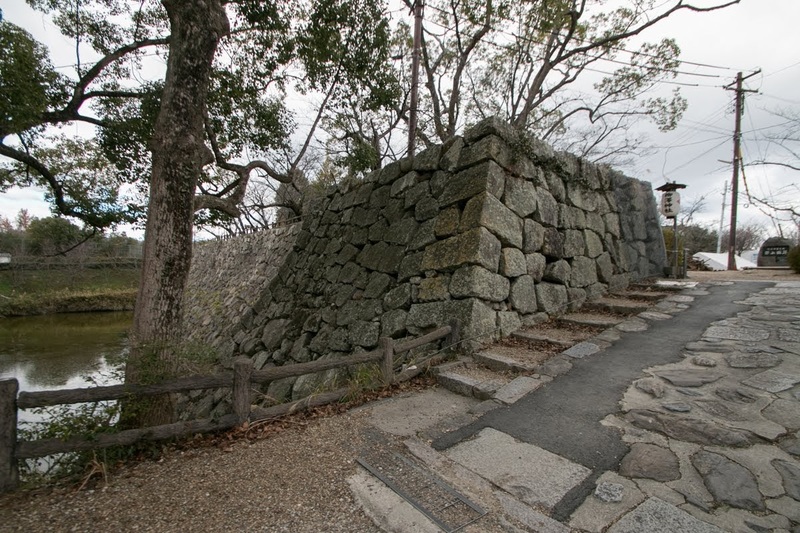 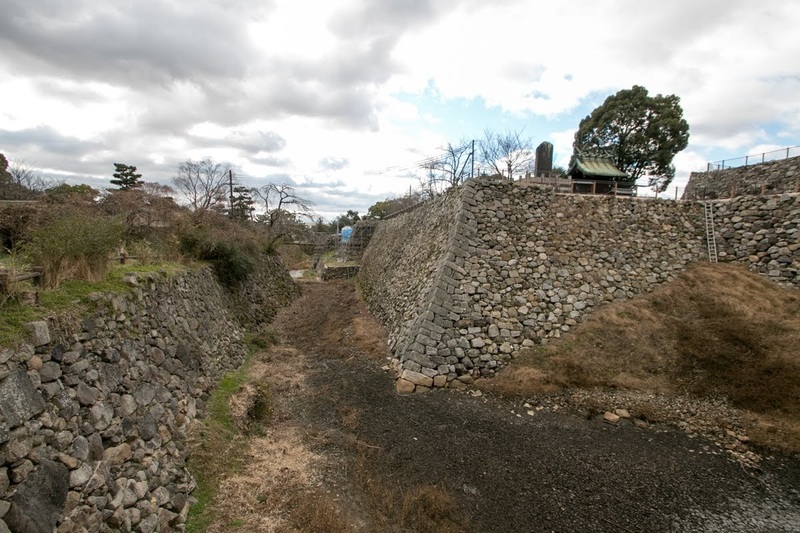 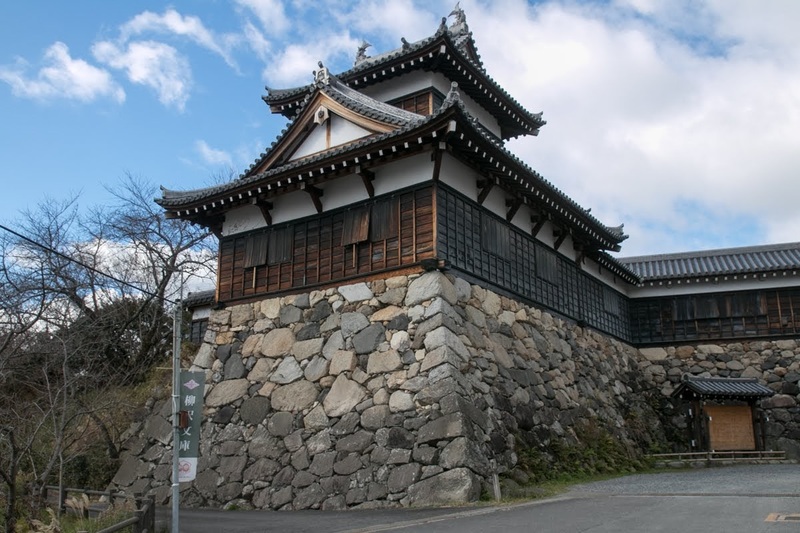 As Sanin area is a mountainious area and takes time to move, thus Hidenaga built many castles equipped with stone walls such as Takeda castle, Arikoyama (Izushi) castle (Hyogo prefecture) using Takatora. 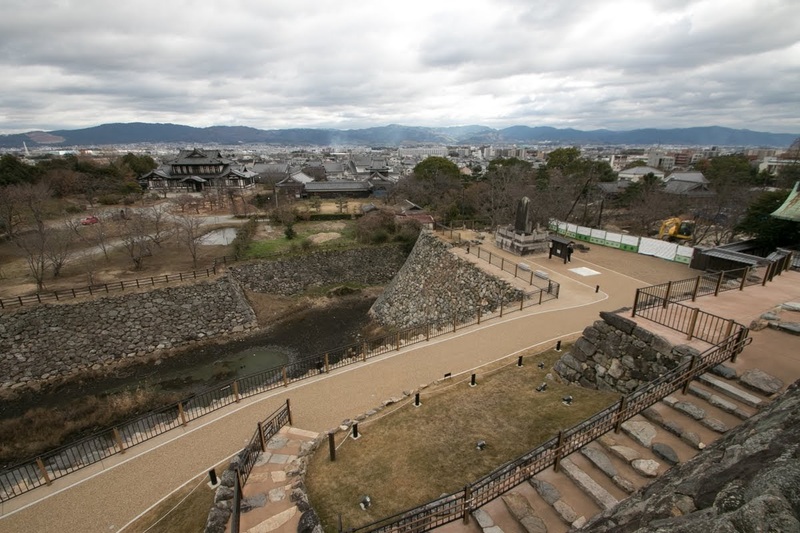 After the incident of Honnoji, Hideyoshi became the next central ruler and moved to Kyoto area. Hidenaga was left Himeji castle, a former main base of Hideyoshi. Further due to the transfer of Tsutsui clan, Hidenaga was also given Yamato country and Kii country in 1585, and had vast area of 1 million Koku aroung Kinki region, the vital area of Toyotomi government. 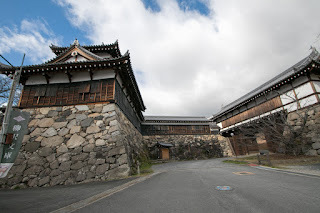 Yamato country and Kii counry were difficult area to govern with non obedient religious powers, but Hidenaga skillfully coordinated with these powers and well managed the countries. 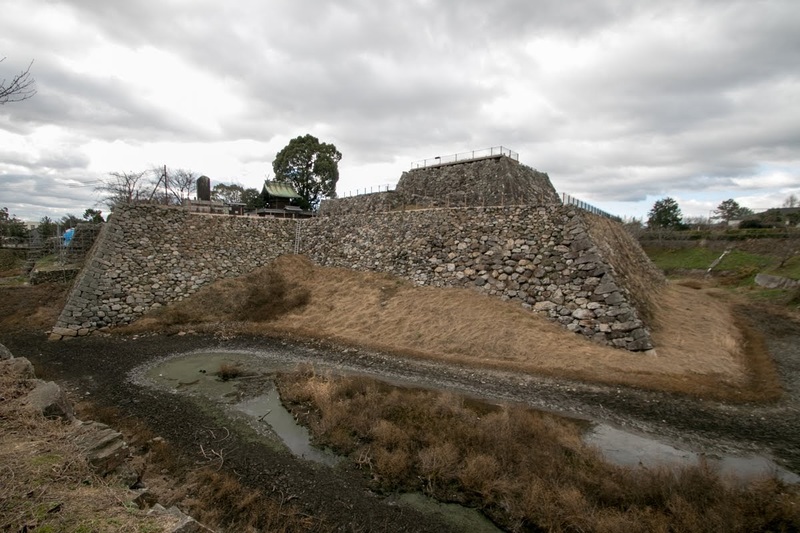 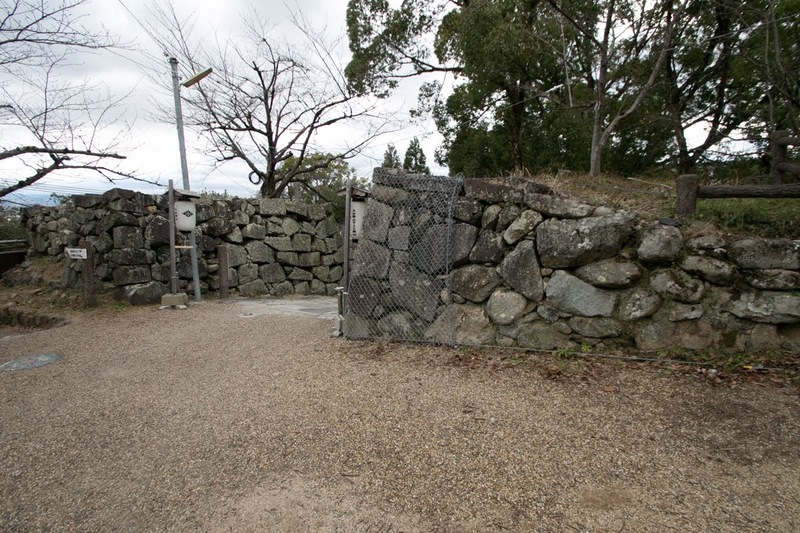 After the entrance to Yamato country Hidenaga significantly expanded Koriyama castle suitable for prominent relative of Toyotomi government, and also rebuilt Takatori castle as a guard against southward. 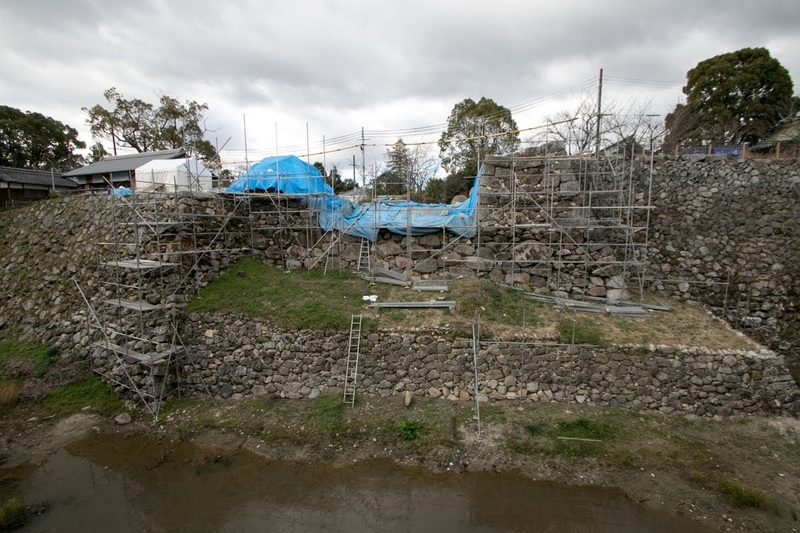 The current shape of the castle basically completed at this time. 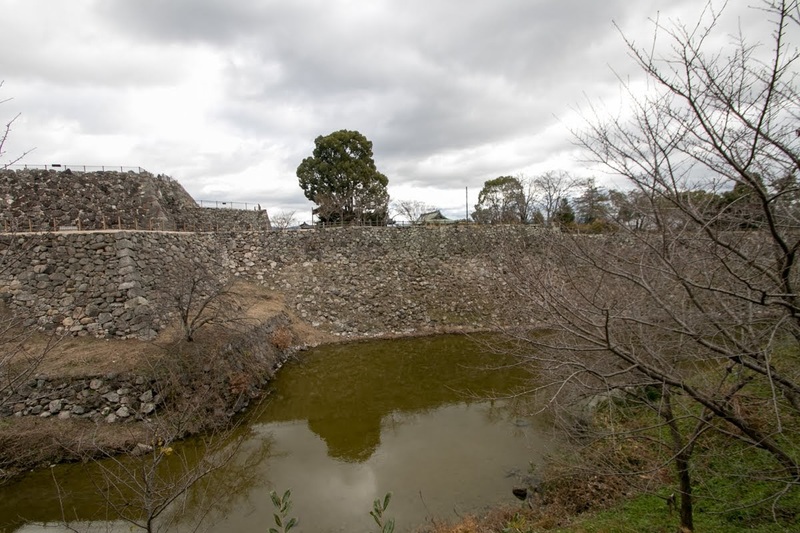 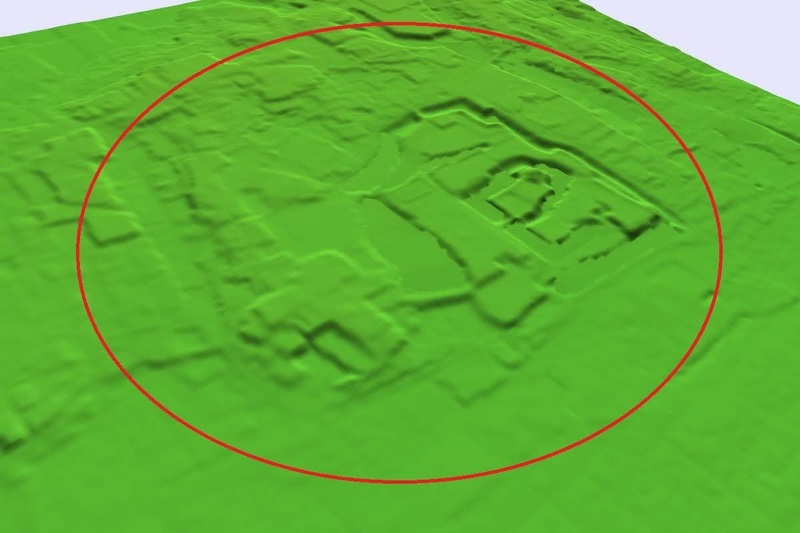 The central area of the castle is about 100 meter square and main tower was built at north west corner of the area. 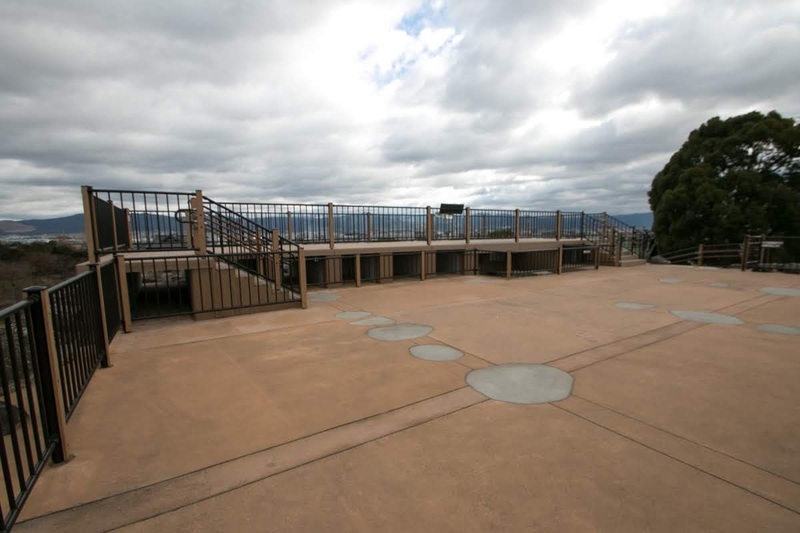 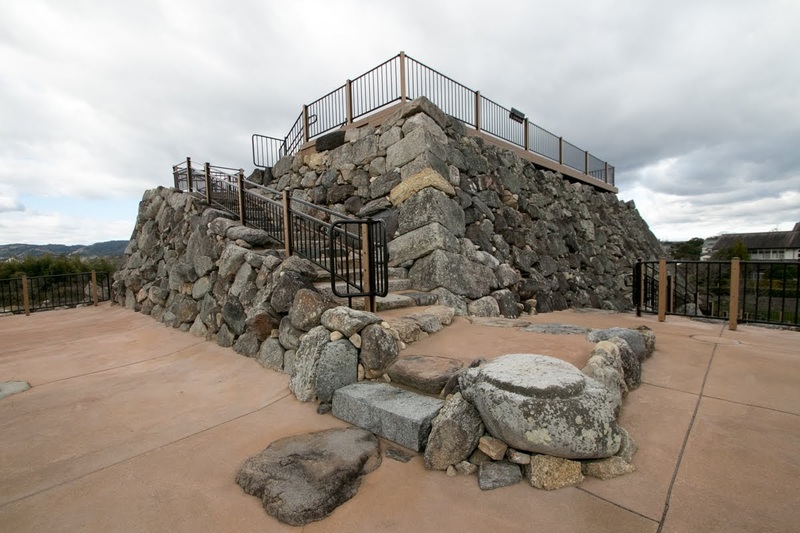 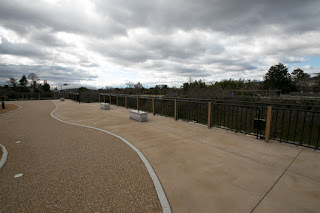 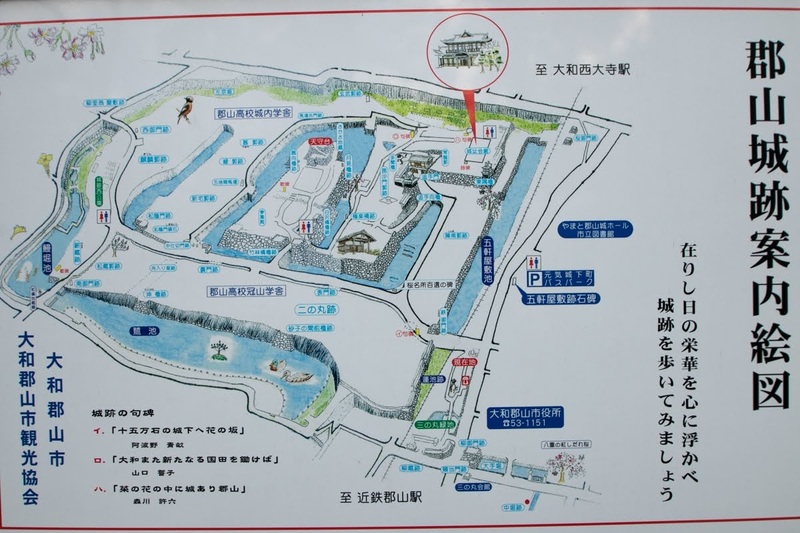 Secondary area and outer areas surrounded central area like whirlpool, and main gate was set at the southeast edge of the height. 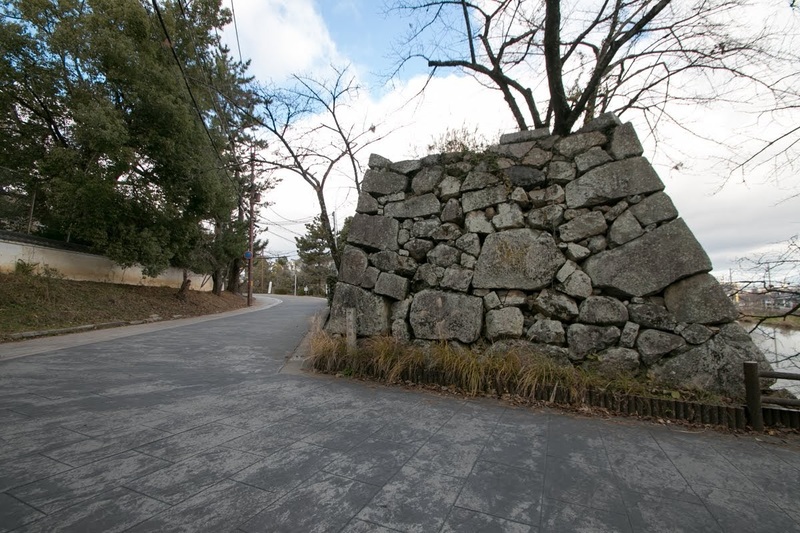 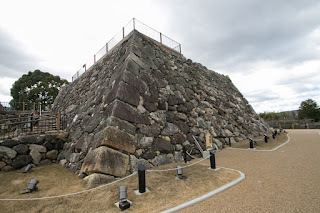 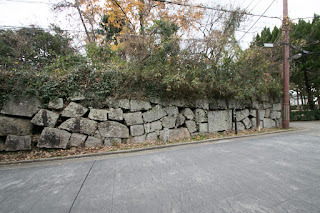 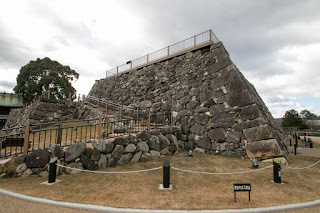 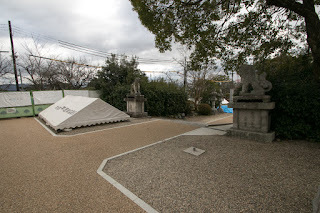 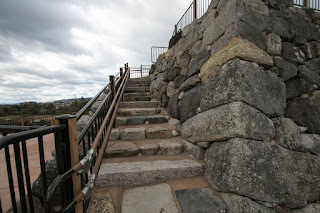 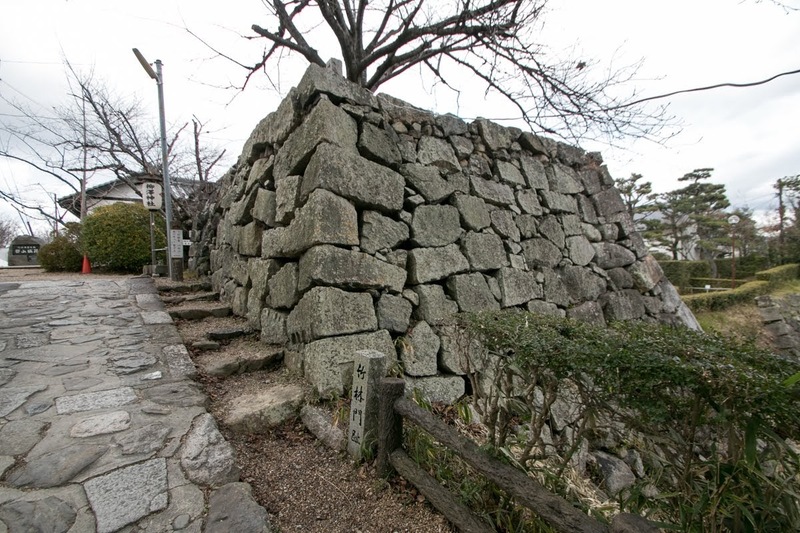 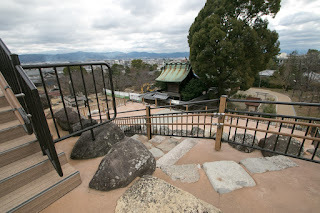 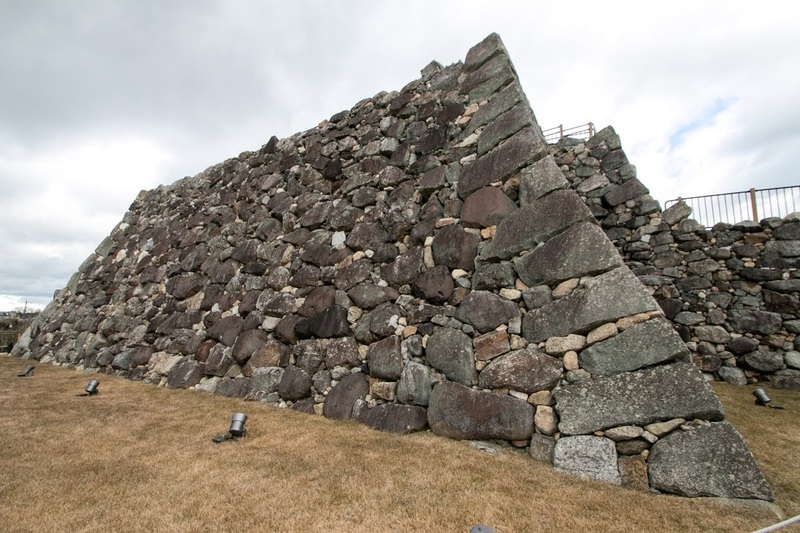 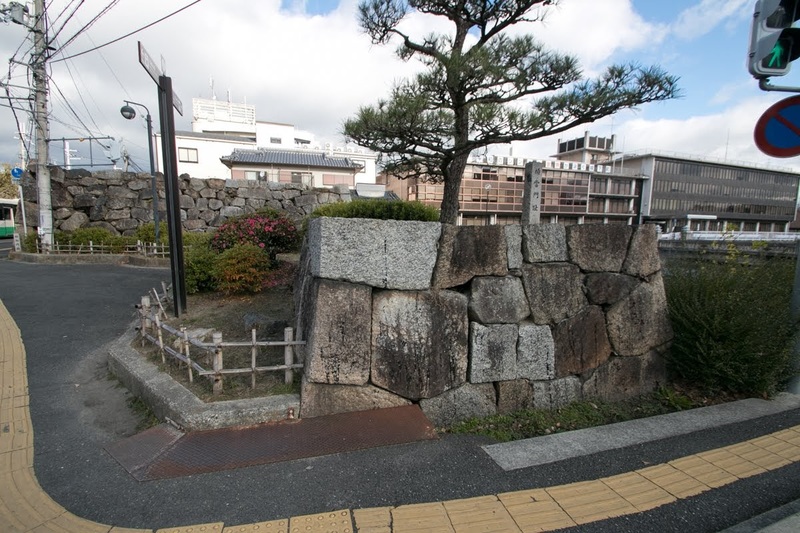 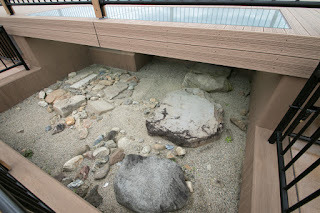 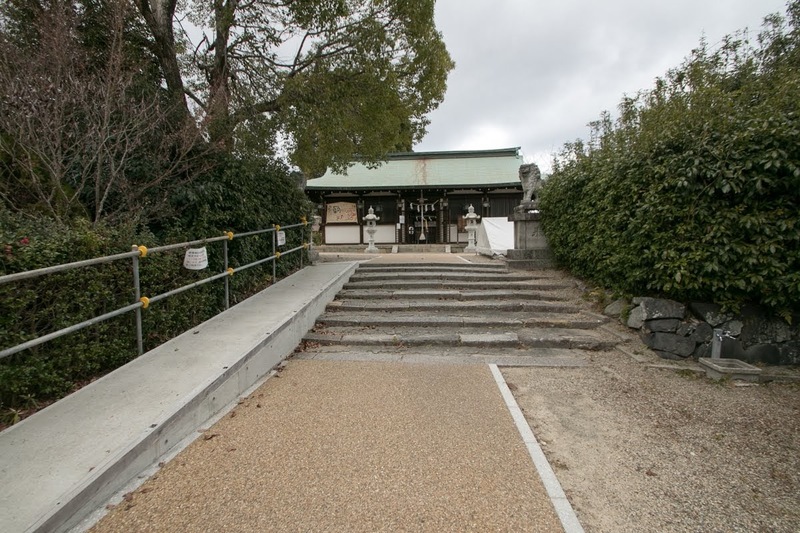 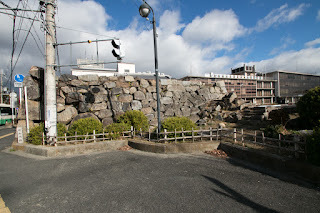 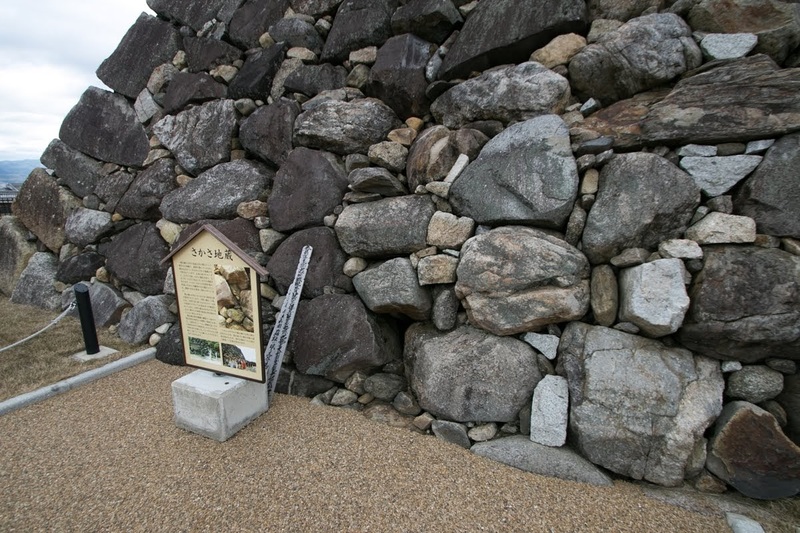 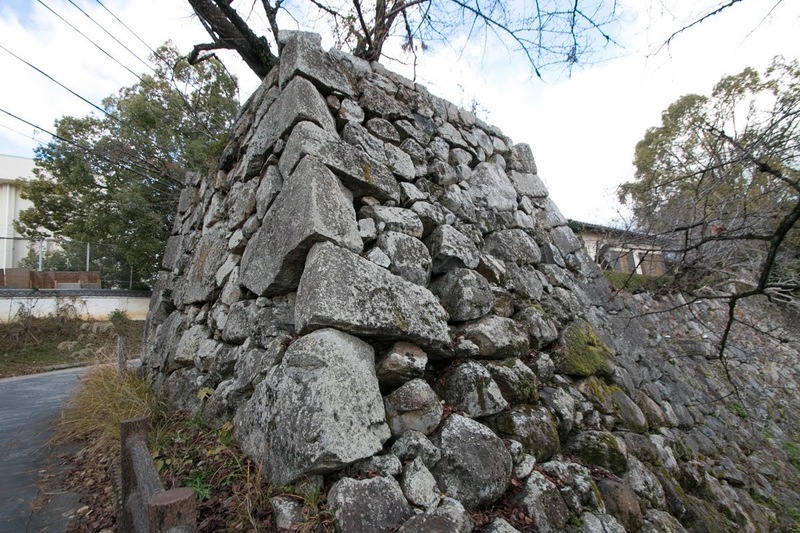 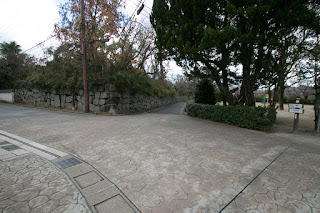 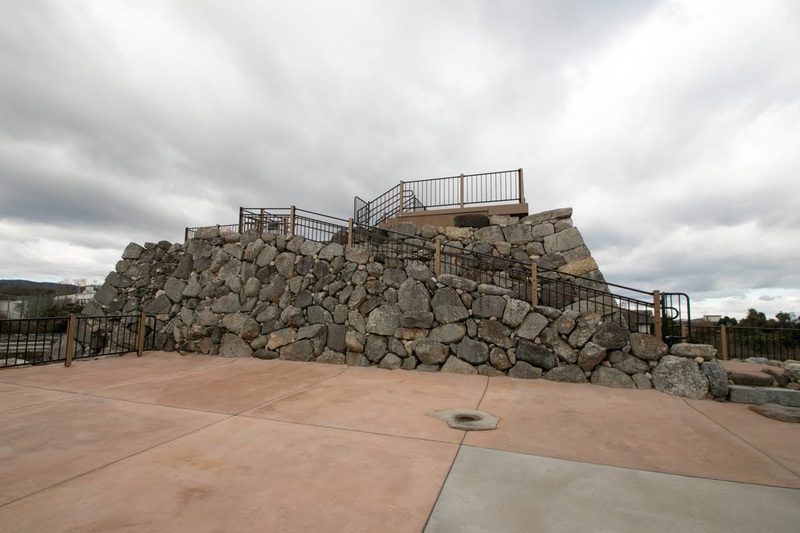 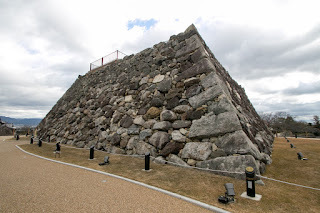 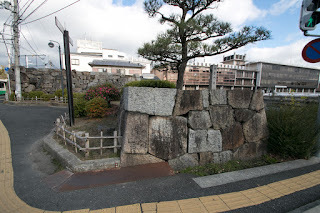 To perform rapid expansion Hidetada forcibly collected many stones from all over the country, and a stone statue of Buddha is found to be thrusted into the stone wall of main tower basement upside and down. Later Hidenaga served as a commander in chief at Shikoku campaign against Chosokabe clan in 1585 and perfectly completed, and also served as a vice commander in chief at Kyushu campaign agaist Shimazu clan in 1588. 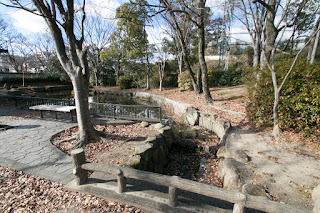 Hidenaga contributed to the decicive victory at the battle of Takajyo castle (Miyazaki prefecture). Hideyoshi could leave army to Hidenaga at ease, but after these campaign Hidetada became ill and died in 1591. 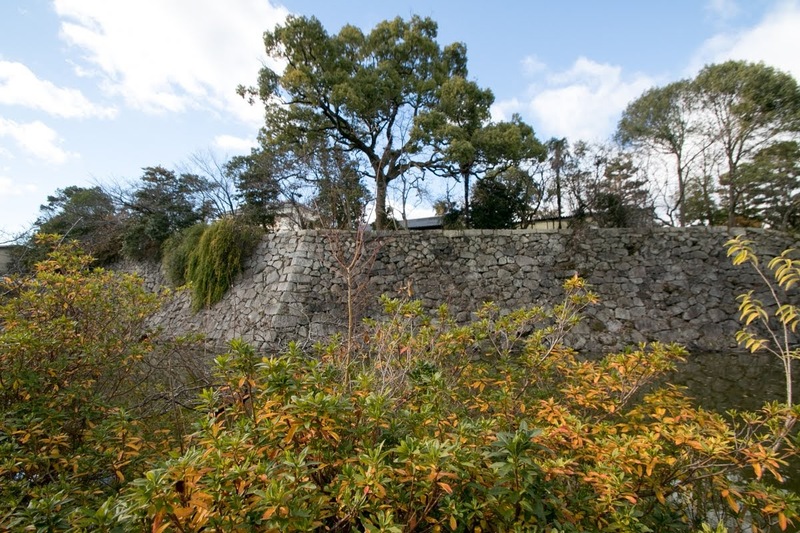 Utilizing his character Hidetada well managed rapidly grown Toyotomi government and well coordinated large lords with Hideyoshi. He also served as a proxy of Hideyoshi, and made remonstrance to Hideyoshi if necessary. 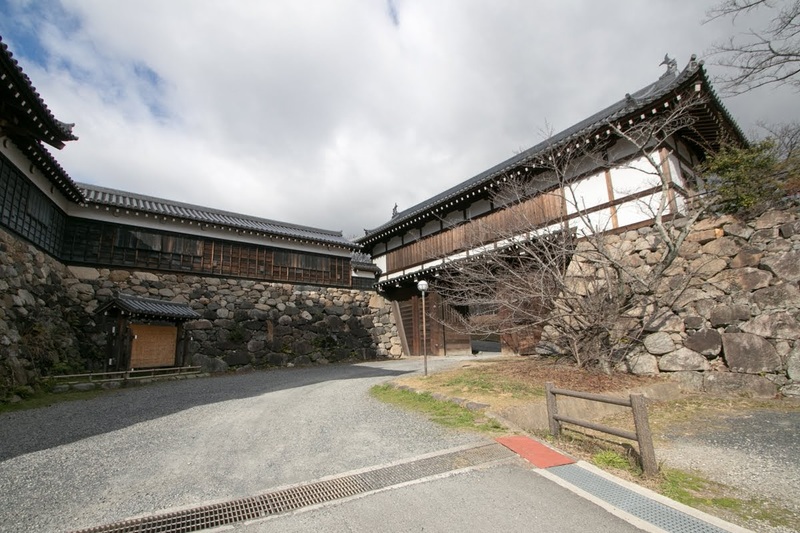 Even though not attracting attention, but Hidenaga’s existence was indispensable to Toyotomi government. After the death of Hidenaga Toyotomi government became split into administrative officers, front generals and large lords, and finally collapted just after 10 years from Hidenaga’s death. 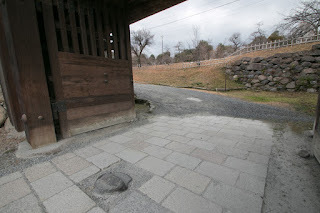 It is frequently said that if Hidenaga lived much longer the fate of Toyotomi clan might be changed. 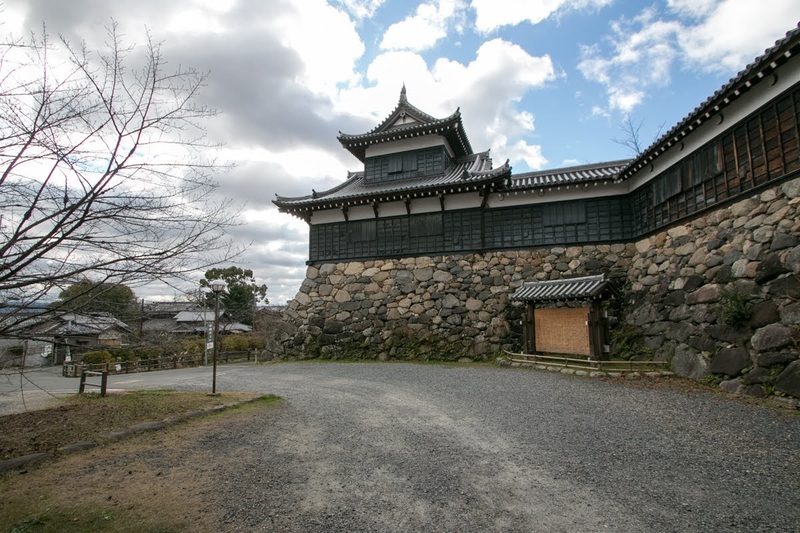 After the death of Hidenaga, Hideyoshi placed Nagamori Mashita (1545-1615), one of five magistrate of Toyotomi government, as a commander of Koriyama castle. 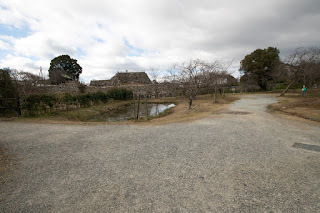 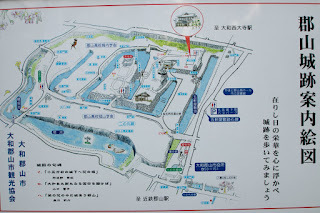 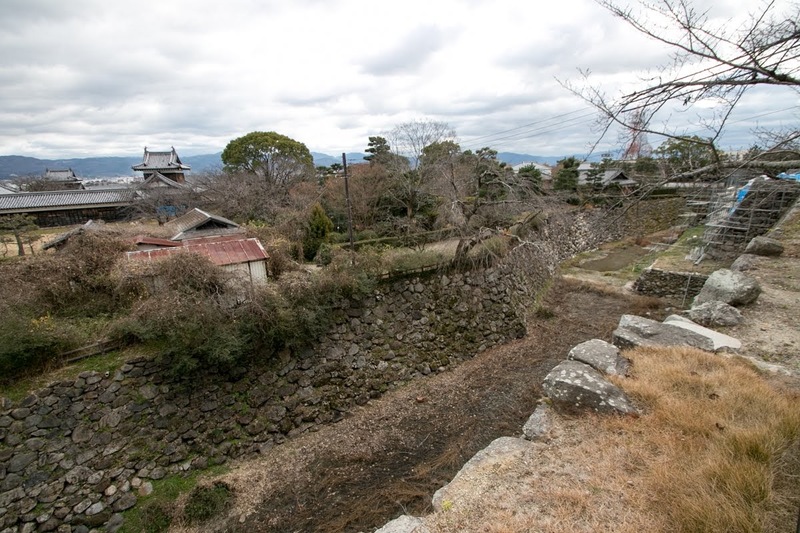 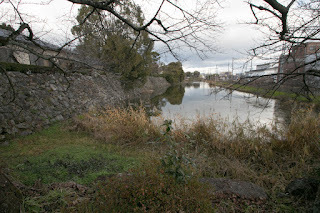 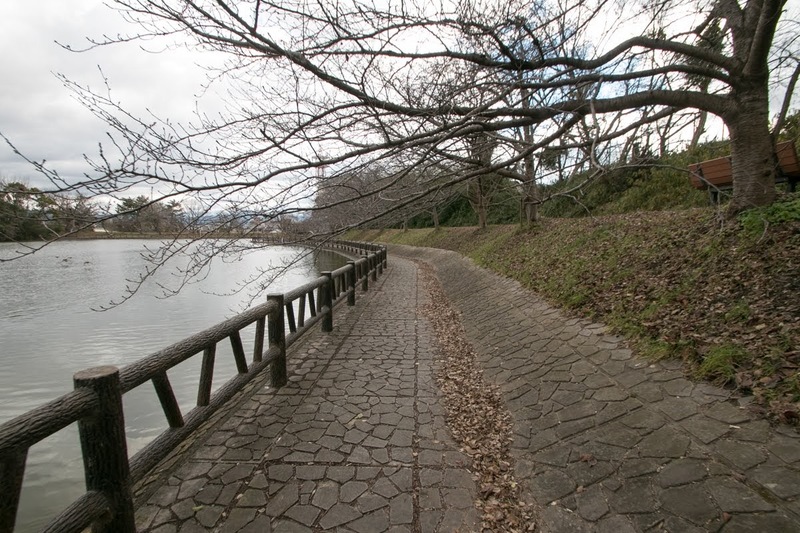 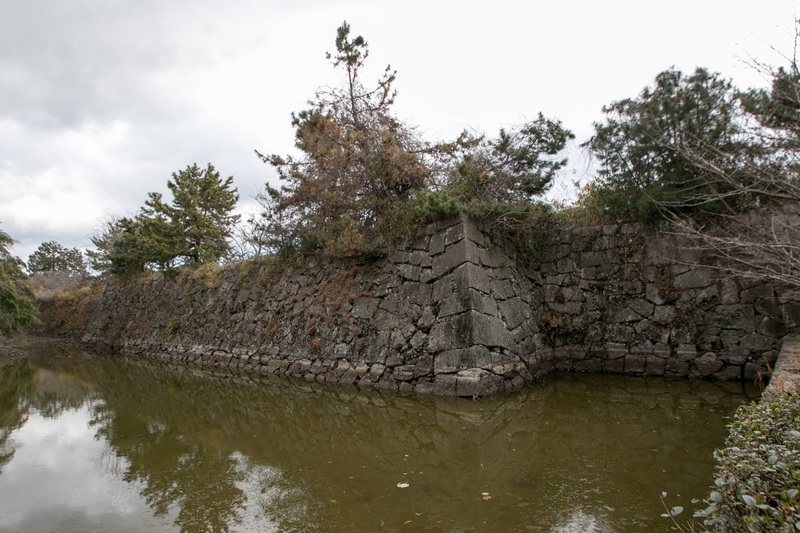 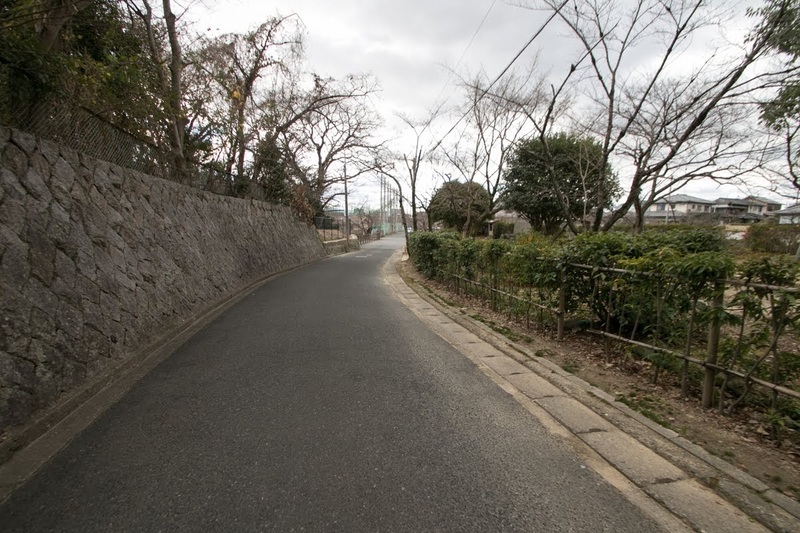 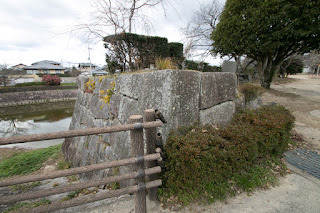 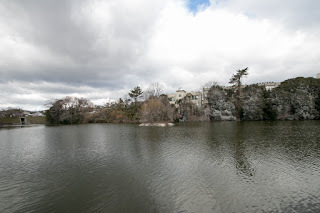 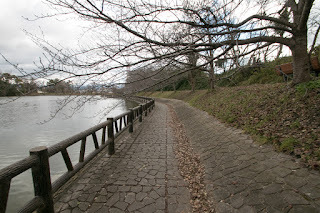 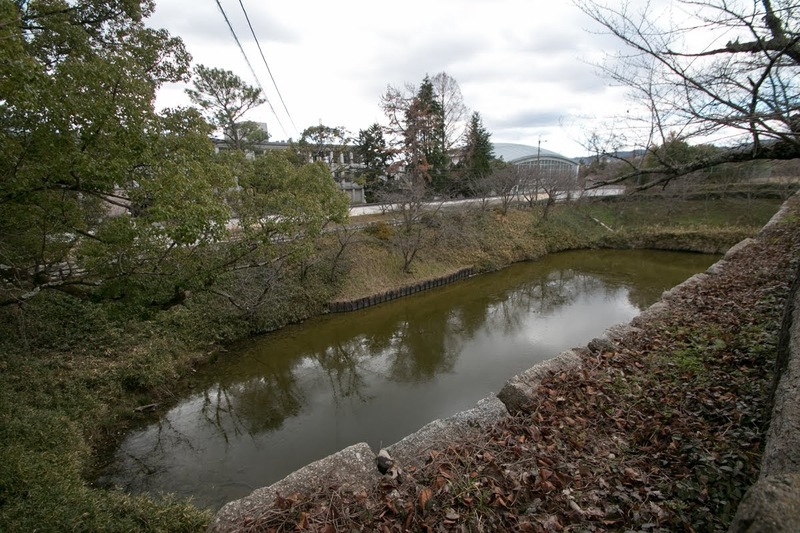 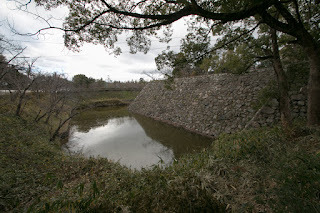 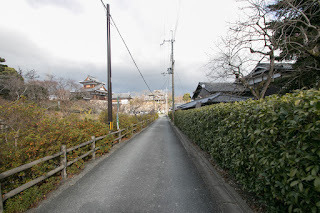 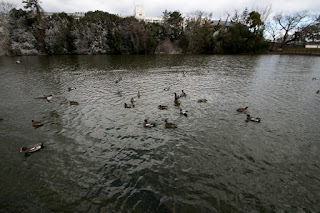 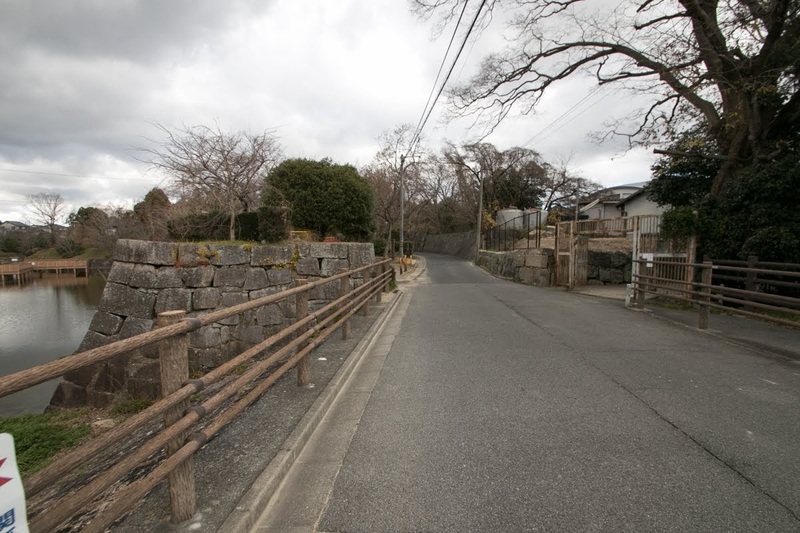 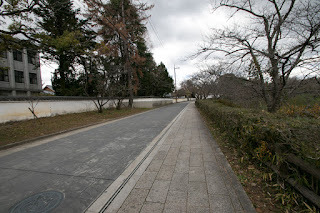 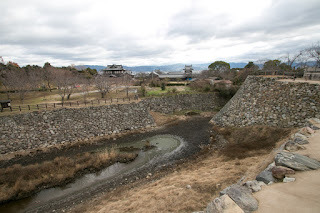 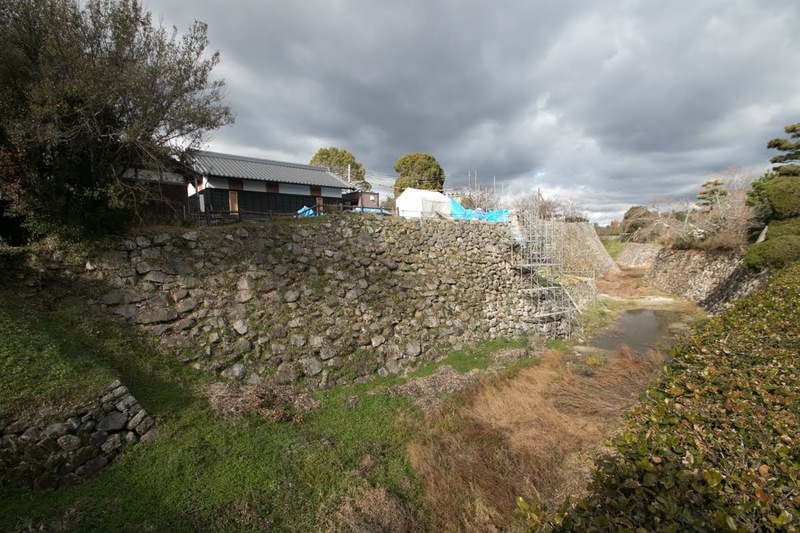 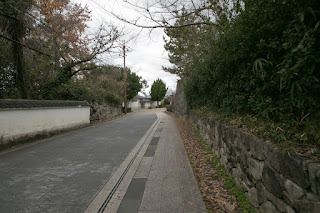 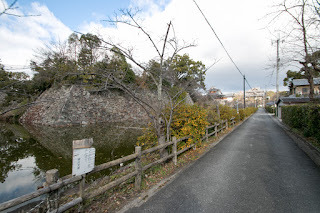 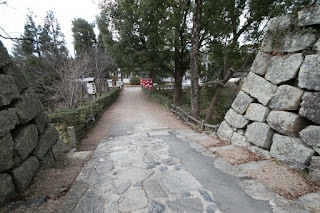 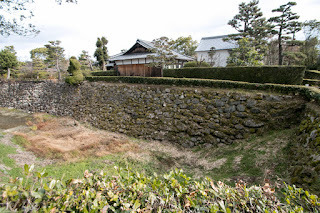 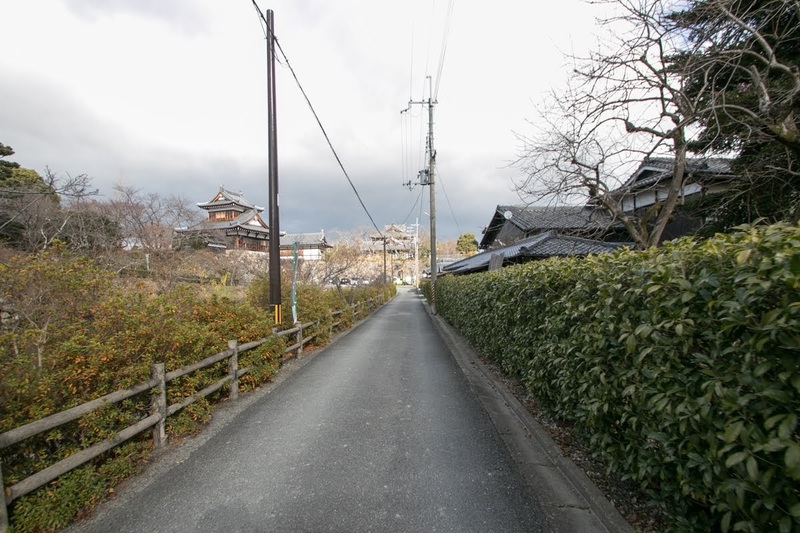 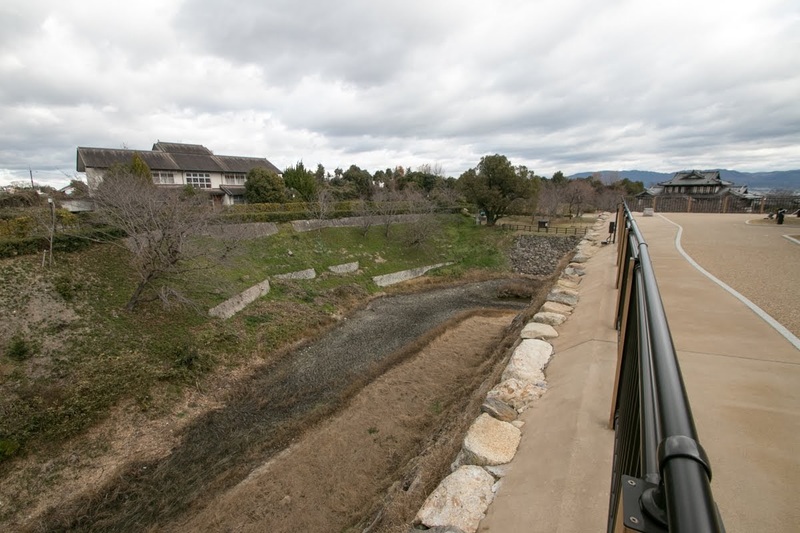 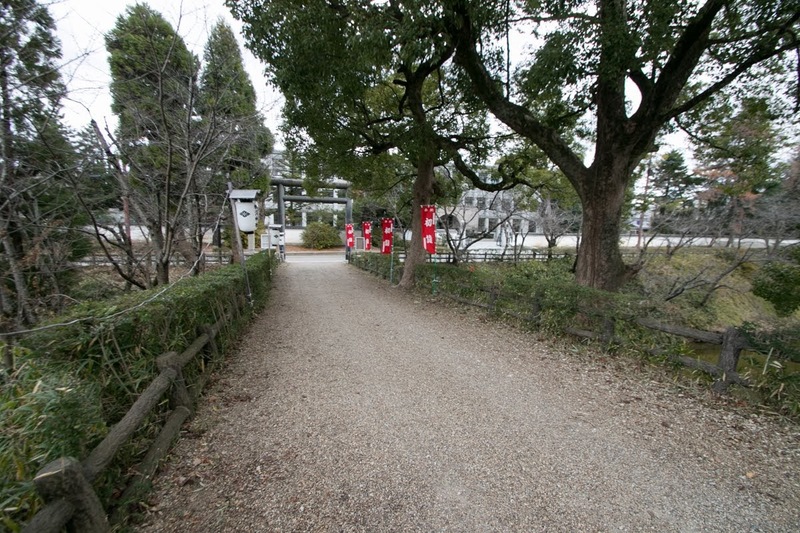 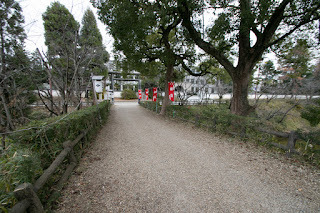 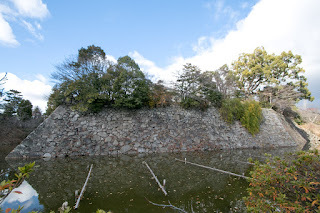 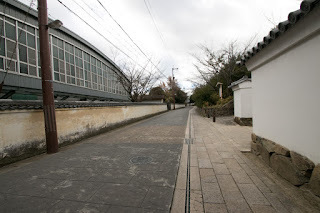 Under Nagamori, castle town was improved and water moat surrounded castle town was built. 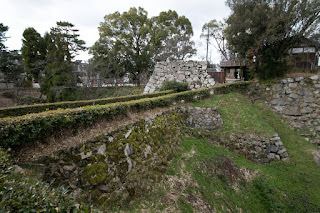 But subsequent to the death of Hideyoshi in 1598, Nagamori supported Mitsunari Ishida (1560-1600), a chief administratve officer of Toyotomi government and raised army against Ieyasu Tokugawa (1543-1616), and expelled by Ieyasu. 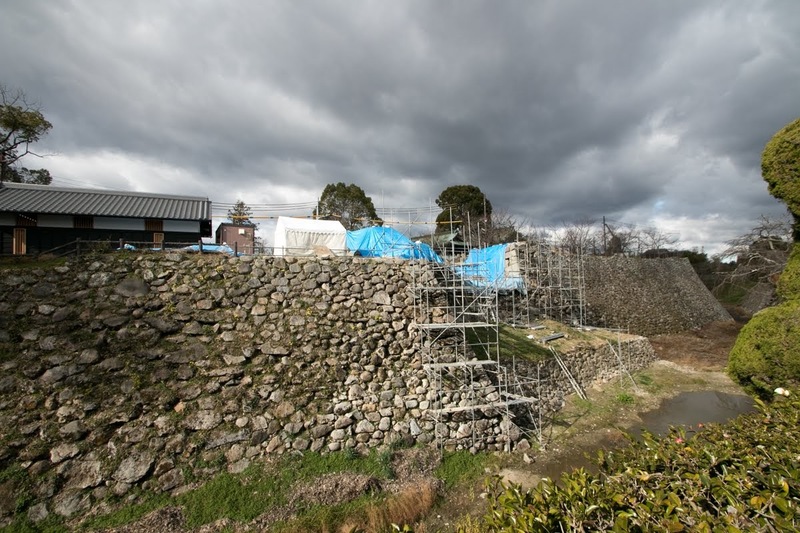 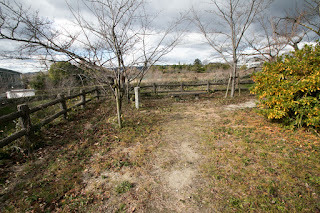 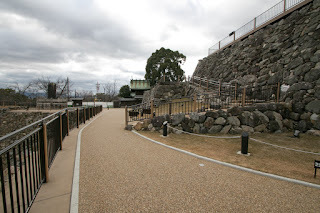 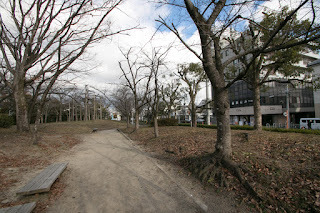 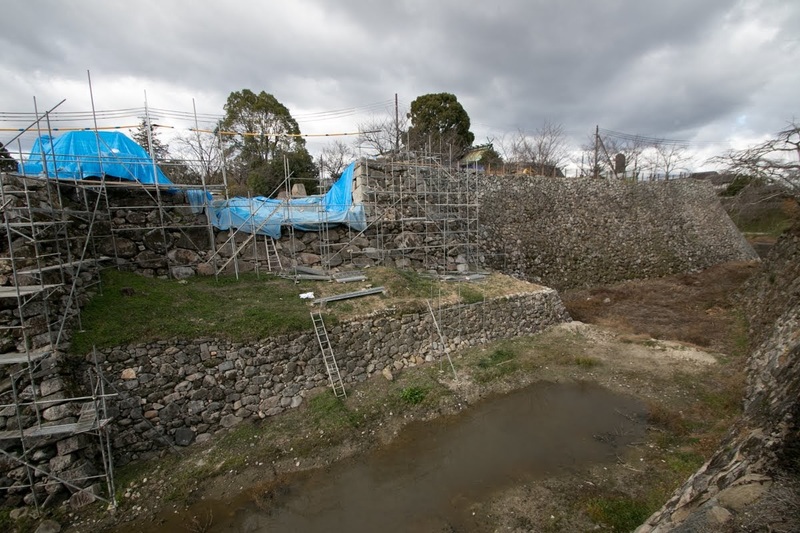 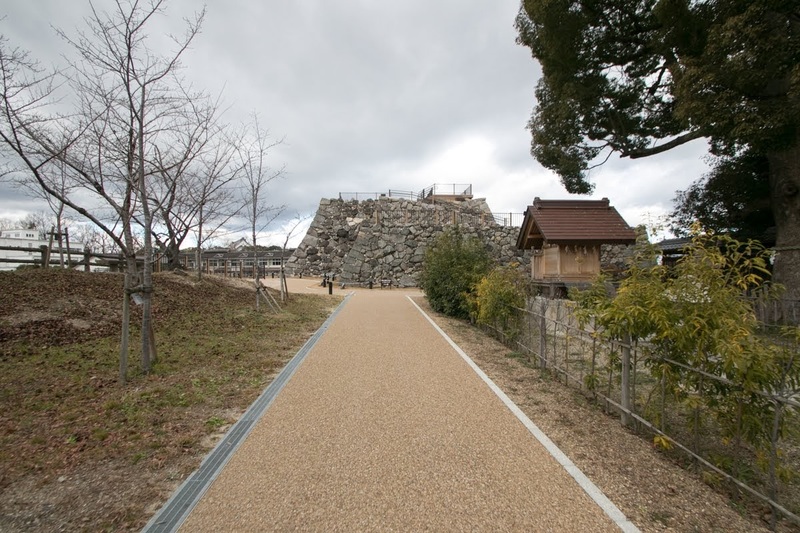 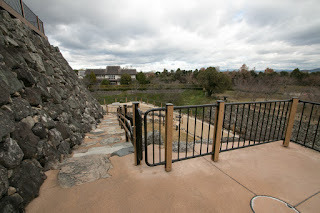 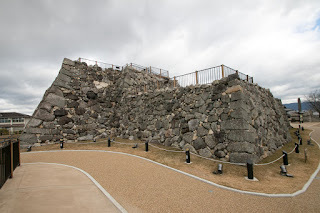 This time buildings of Koriyama castle was once destructed. 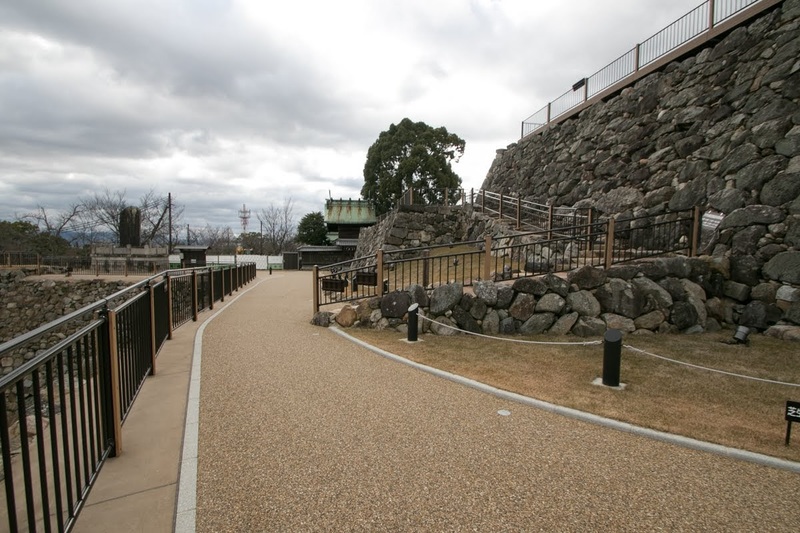 After the battle of Osaka castle in 1615, Tokugawa government appointed hereditary retainers such as Mizuno clan or Honda clan as commander of the castle, and they reconstructed buildings of Koriyama castle. 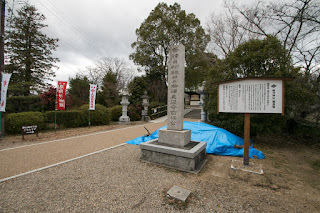 In 1724, Yoshisato Yanagisawa (1687-1745), son of Yoshiyasu Yanagisawa (1658-1714) who was the highest retainer at the time of fifth Shogun Tsunayoshi Tokugawa (1646-1709), was transferred from Kofu castle (Yamanashi prefecture). 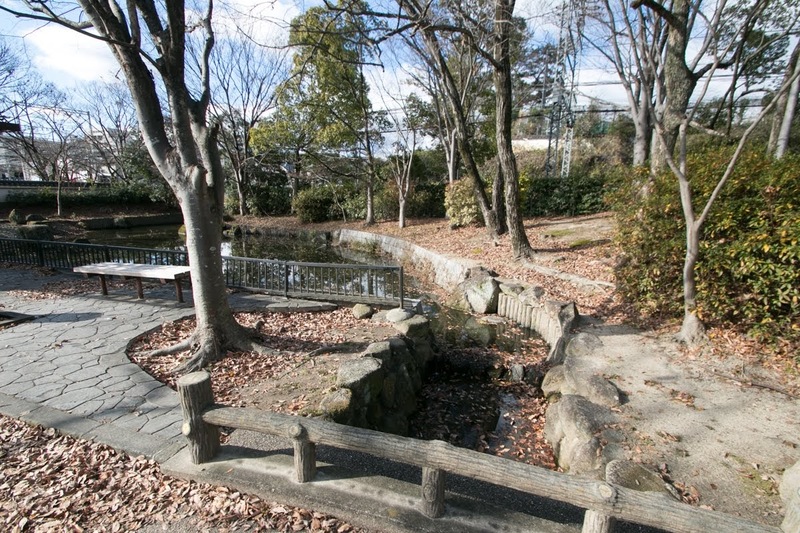 Yoshisato stabilized the situation of Koriyama domain, and also brought culture of gold fishes. 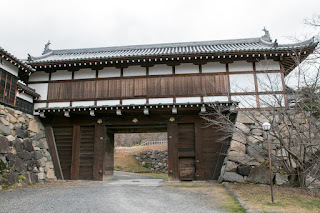 Yanagisawa clan had governed Koriyama castle until the end of Edo era. 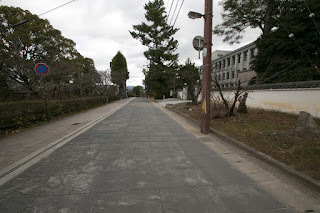 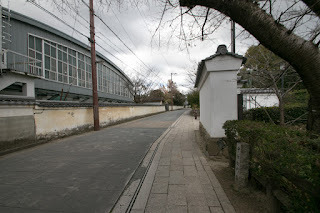 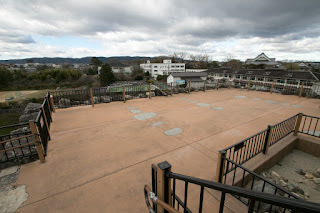 Subsequent to Meiji revolution all buildings except for one gate transferred to neighbor temple were broken, and outer areas were transformed into schools. 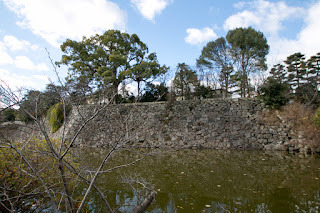 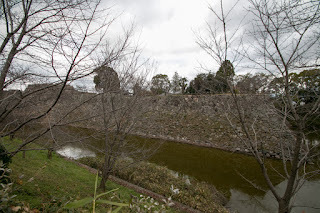 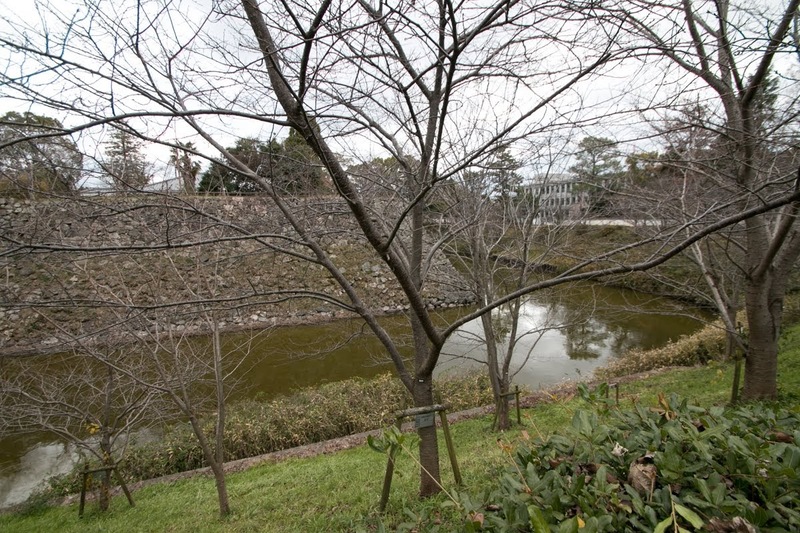 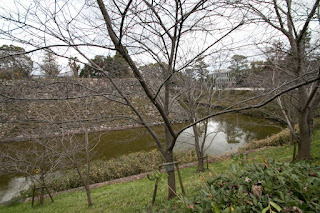 But tall stone walls and deep moat around central area and secondary area well remain, and outer water moat partially exist as river or ponds around the castle. 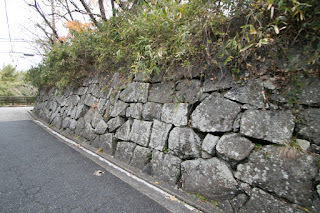 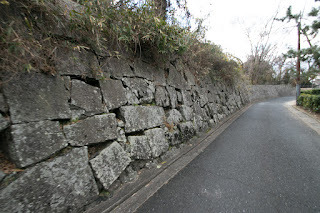 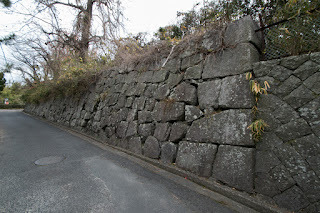 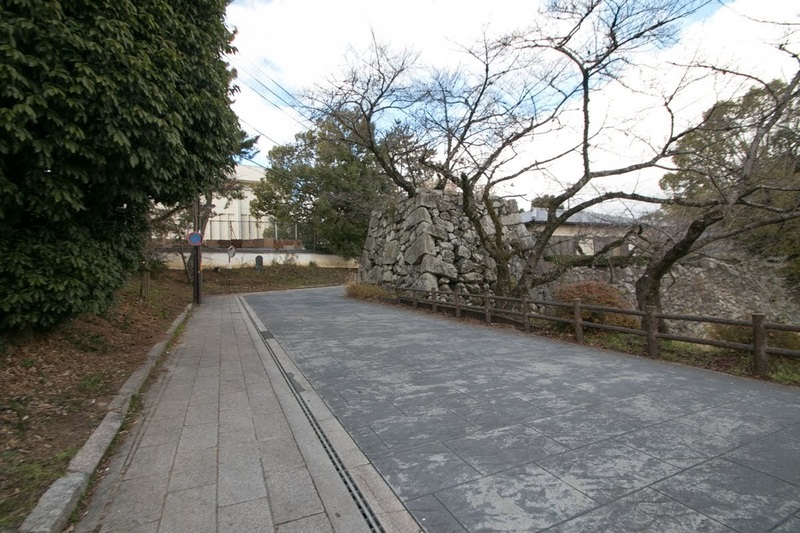 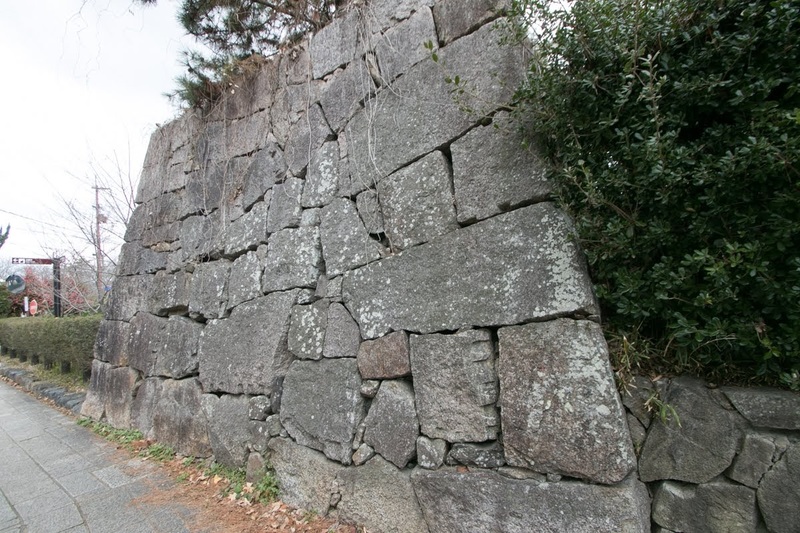 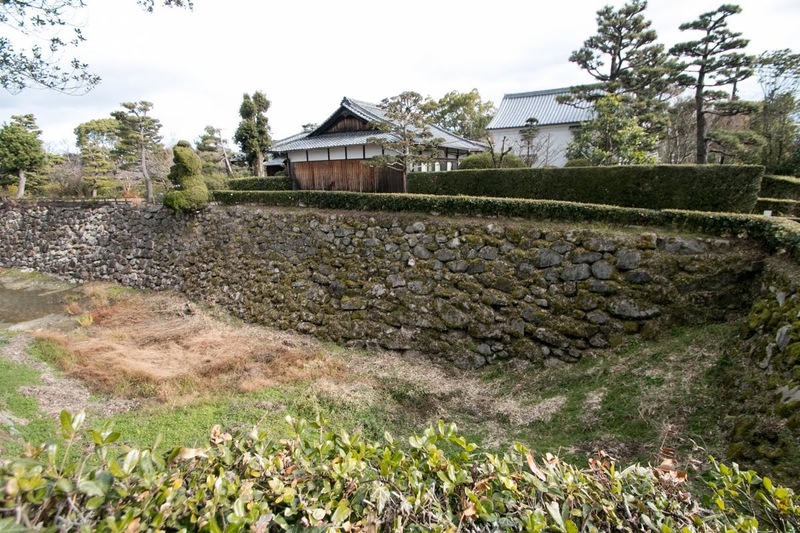 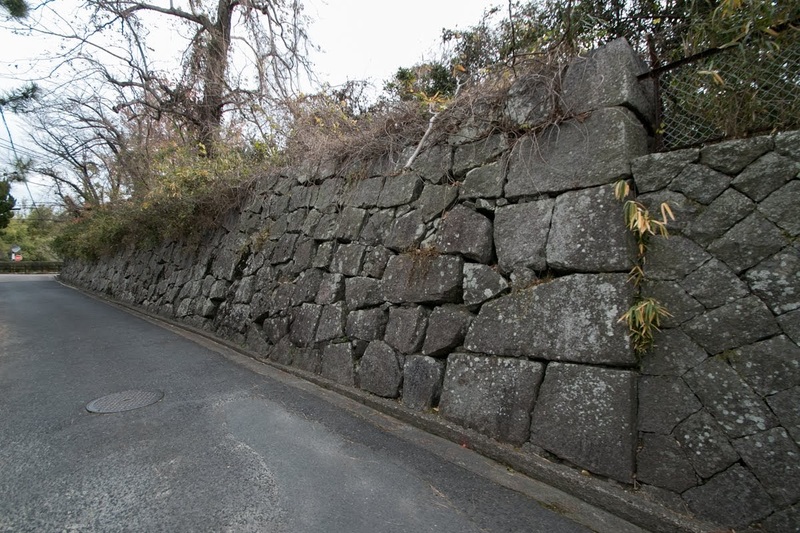 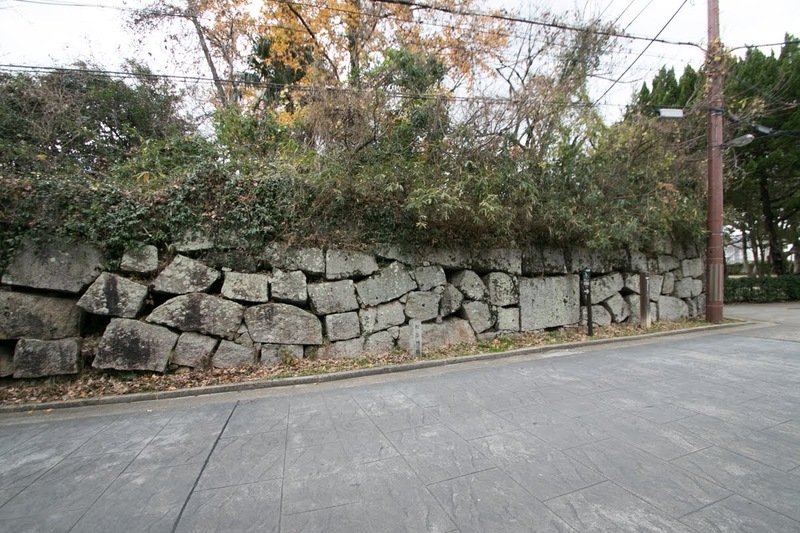 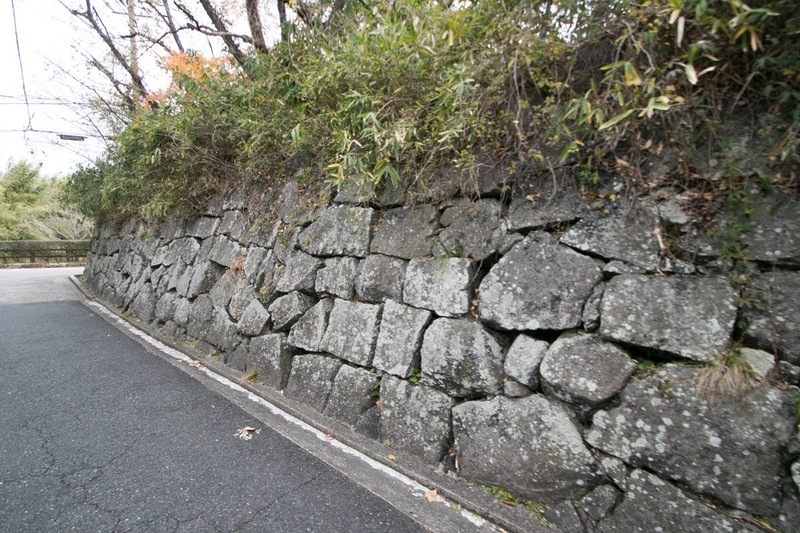 Magnificent stone walls of the castle still show the importance of Hidenaga who devotedly supported Toyotomi government. 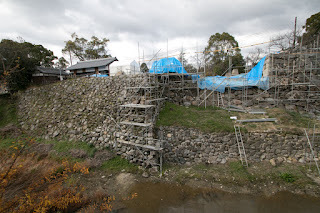 Note that now repair of main tower basement is proceeding by 2017 and basement area is off limit. 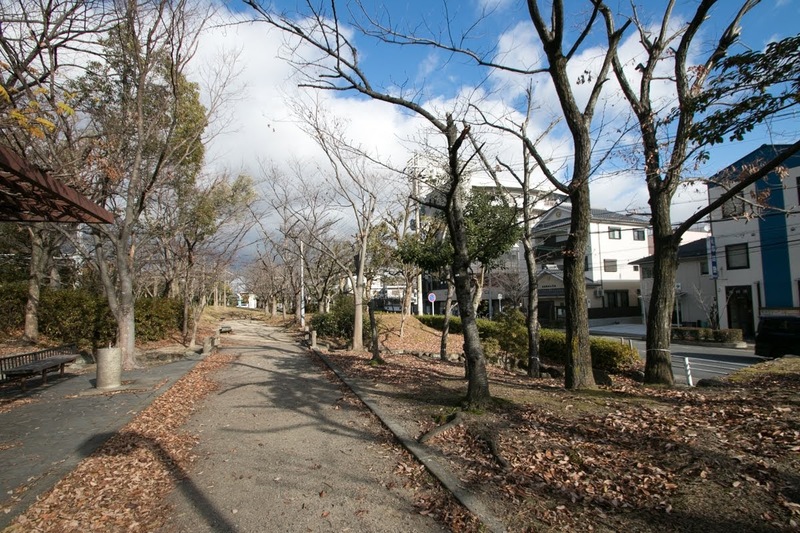 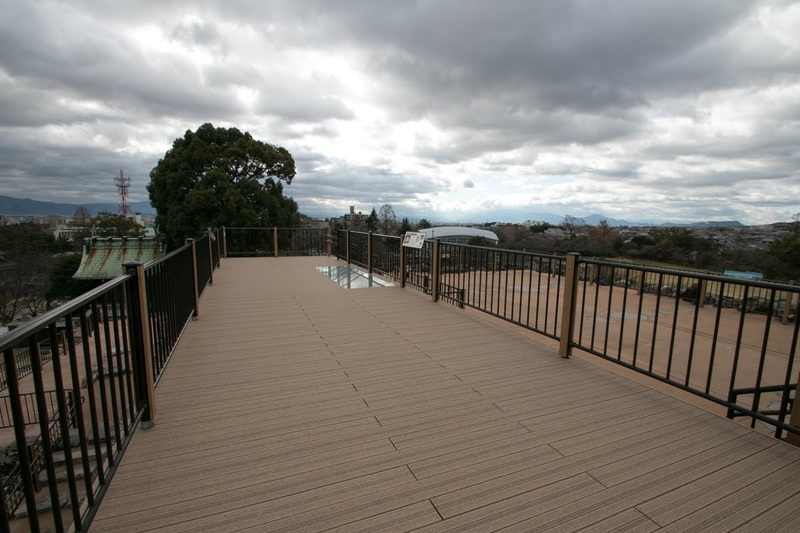 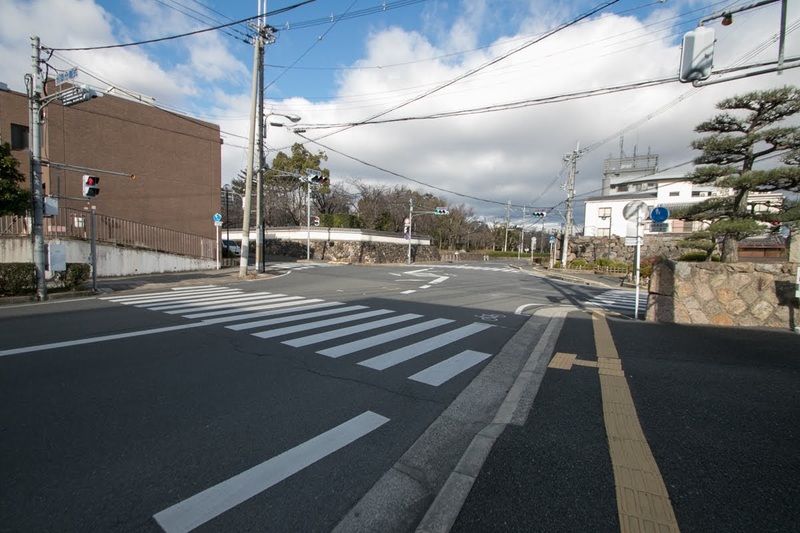 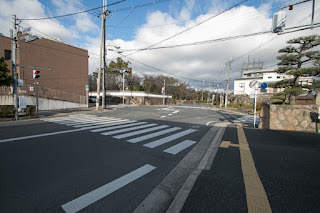 15 minutes walk from Kintstsu Kashihara-sen line Kintetsu Koriyama station. 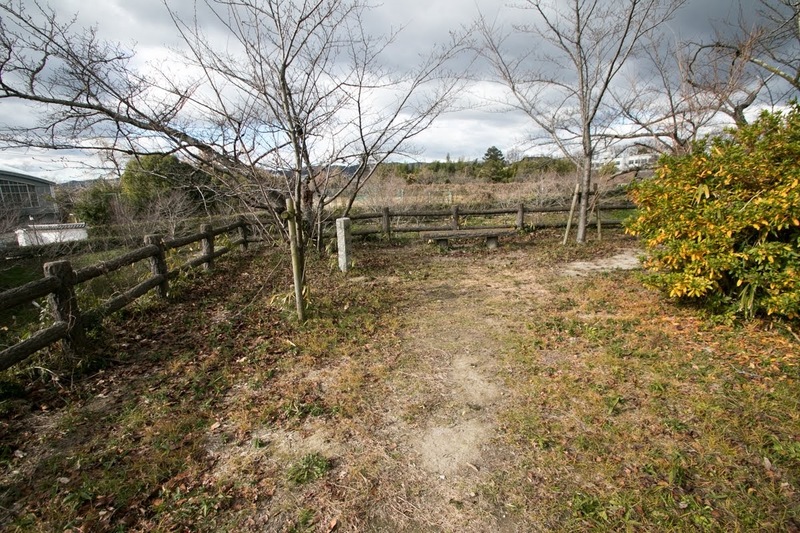 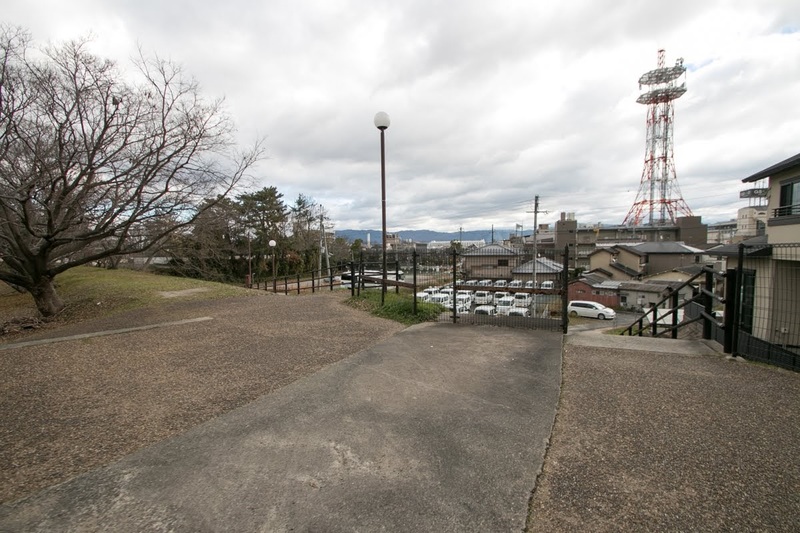 30 minutes walk from JR West Kansai-Honsen line Koriyama station. 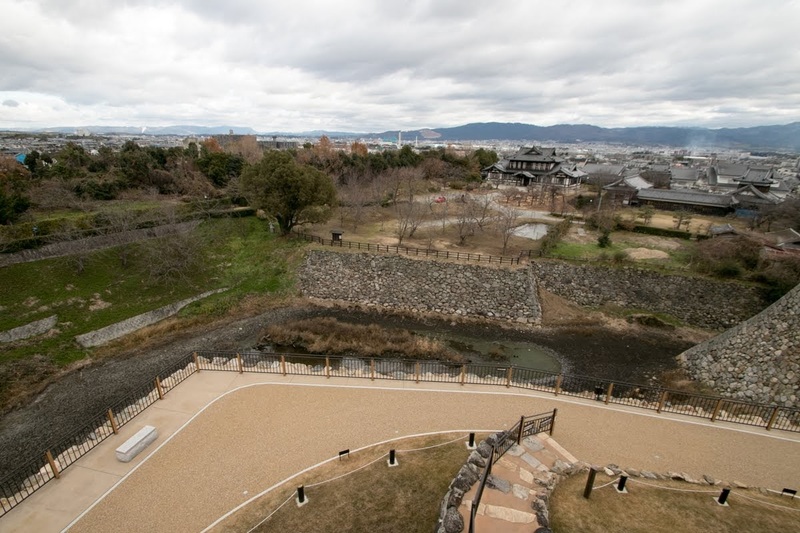 20 minutes drive from Nishi-Meihan Jidoshado Expressway Koriyama interchange.